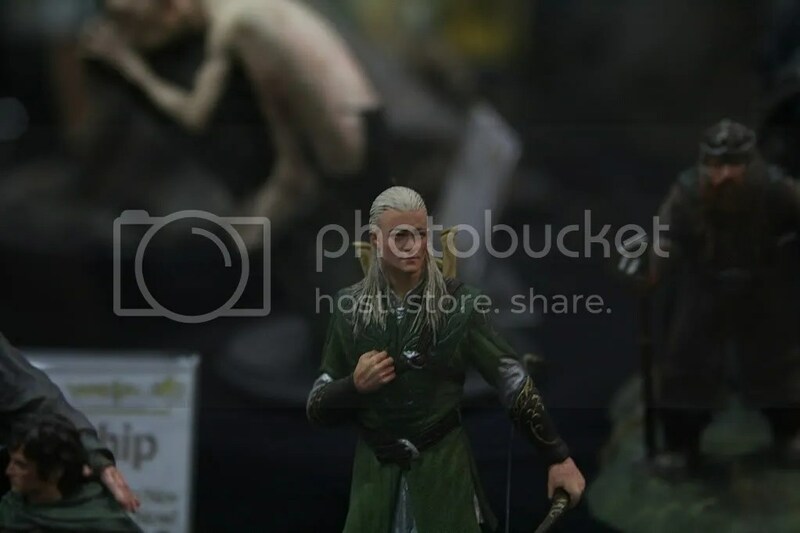 The Pulse | What's Going On In The World Of Collecting! 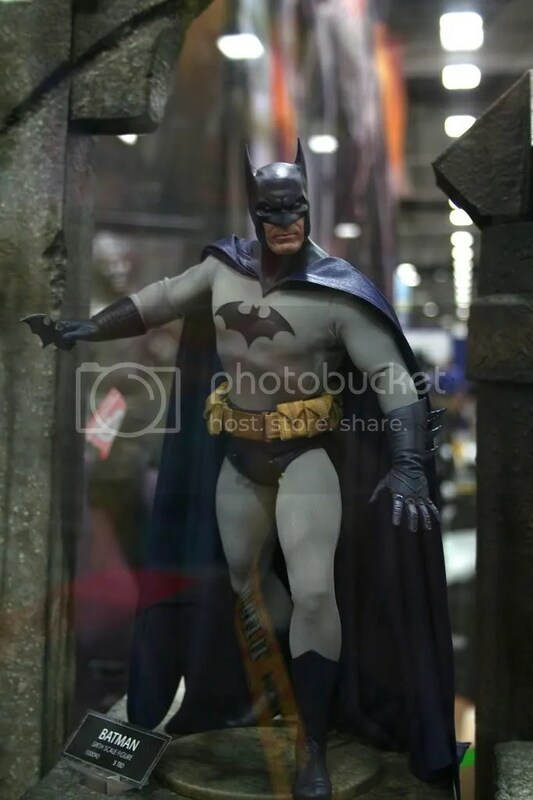 What's Going On In The World Of Collecting! 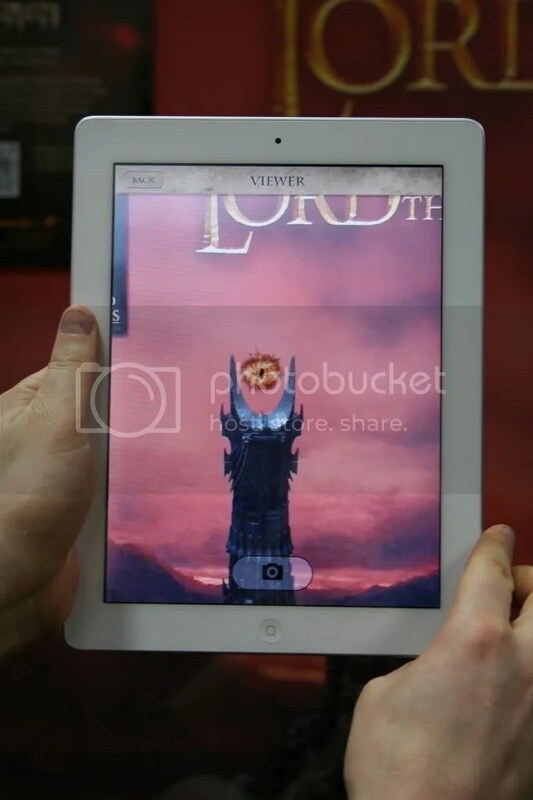 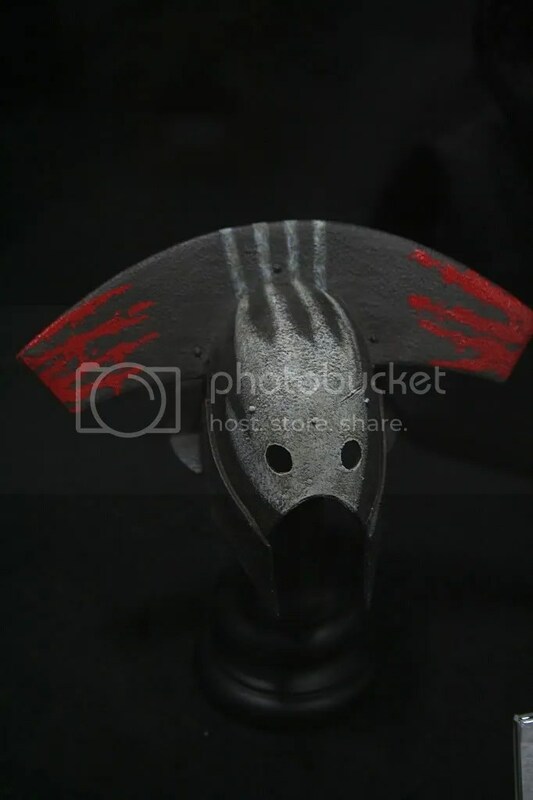 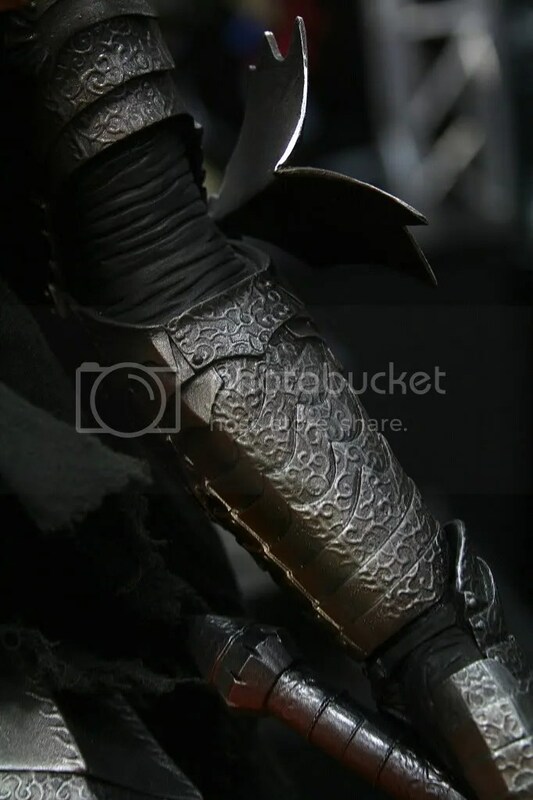 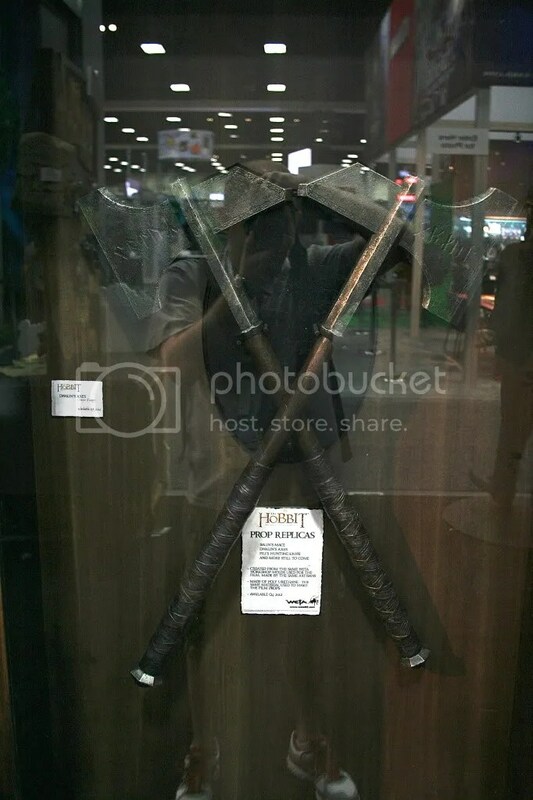 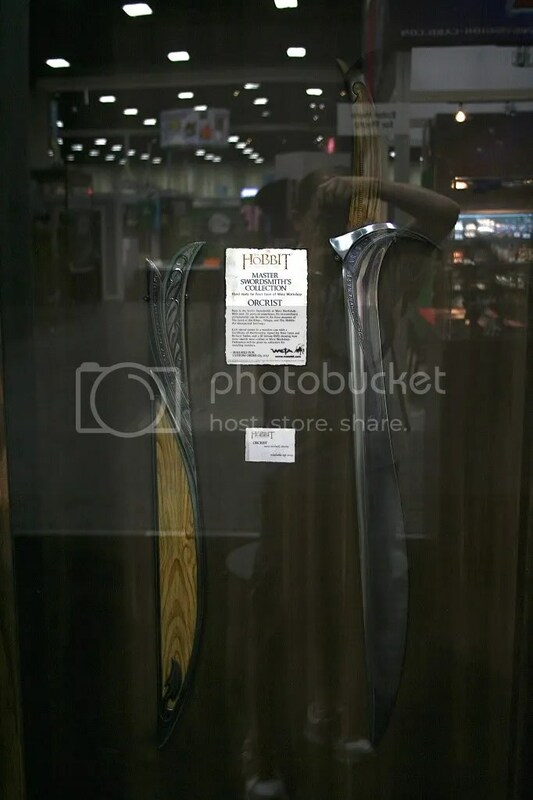 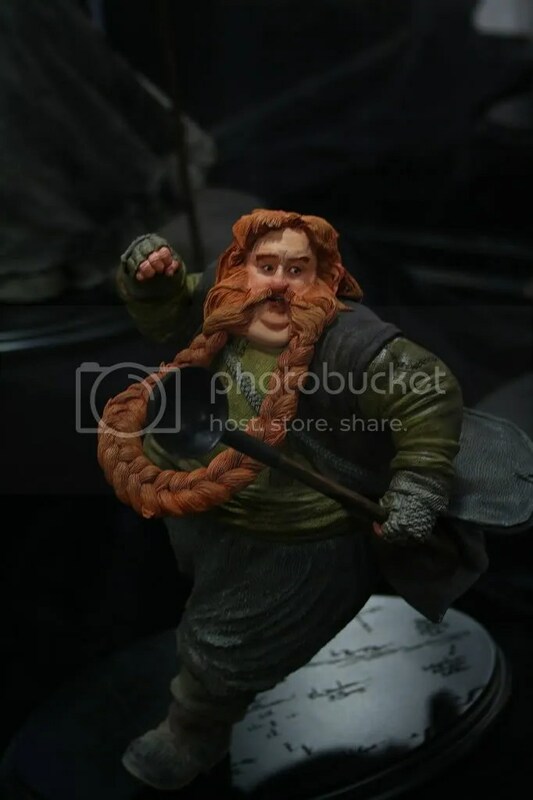 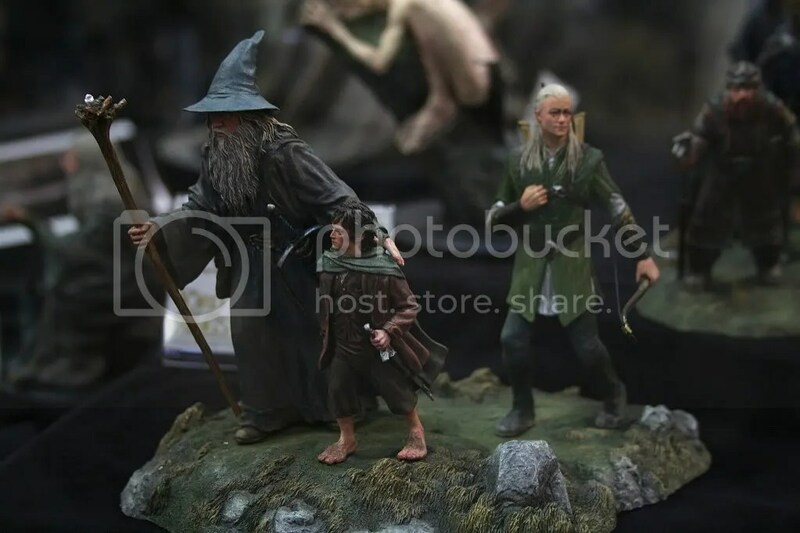 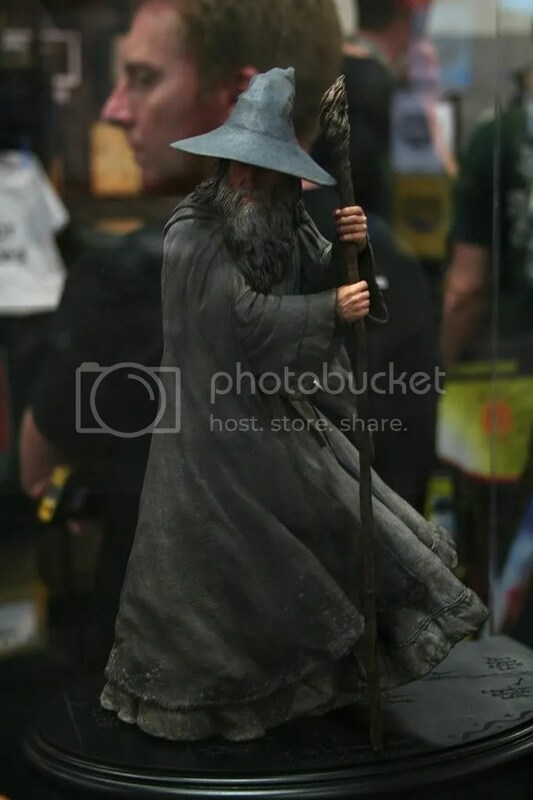 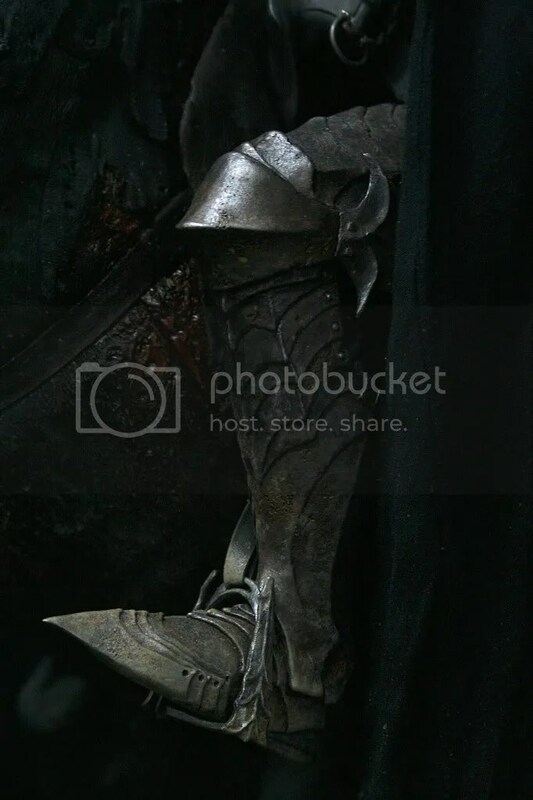 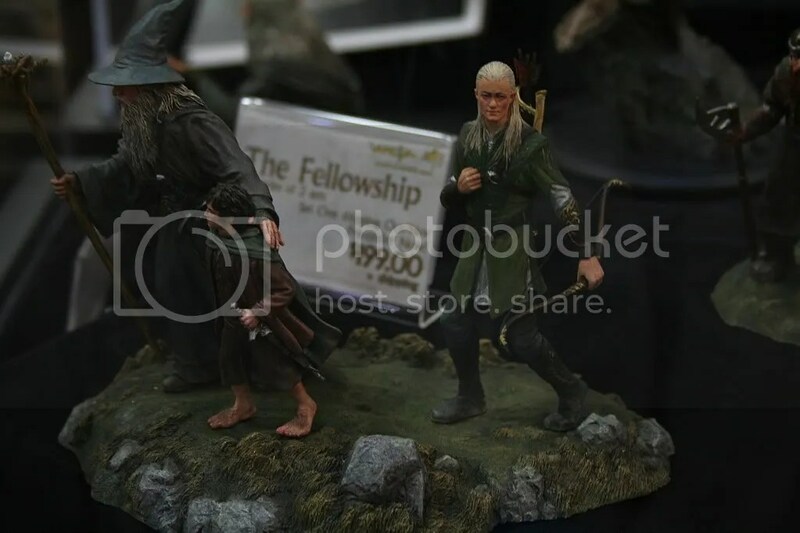 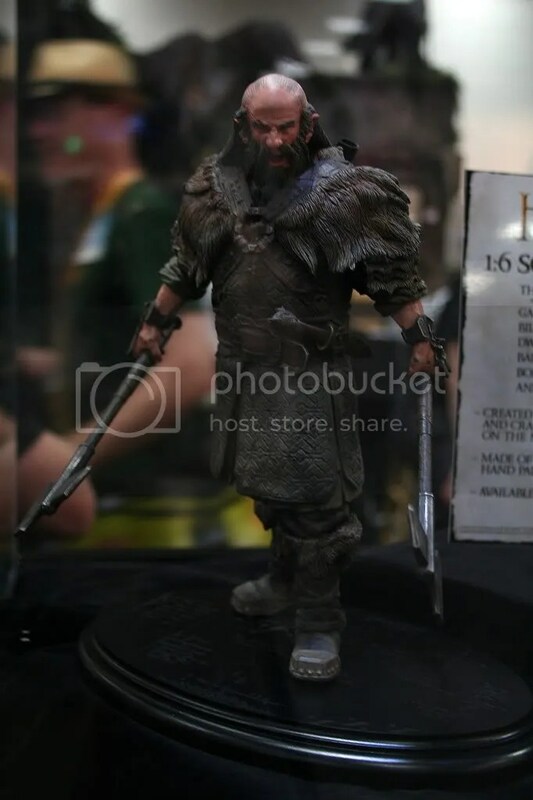 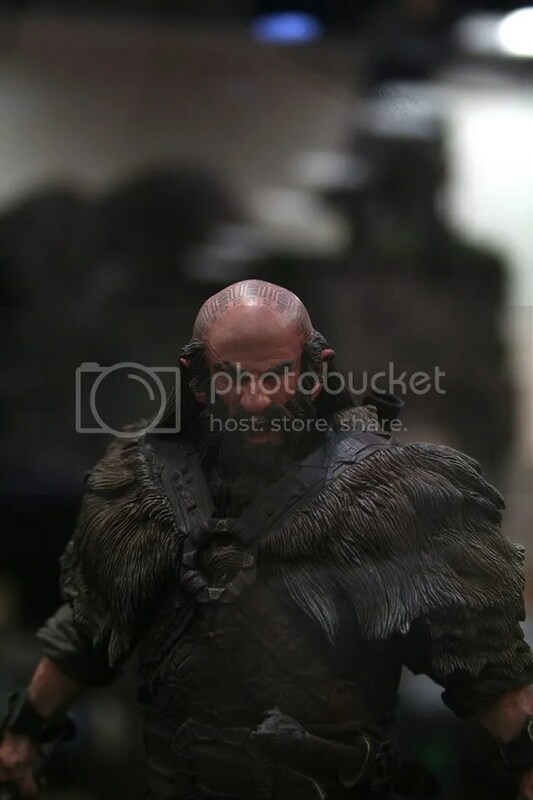 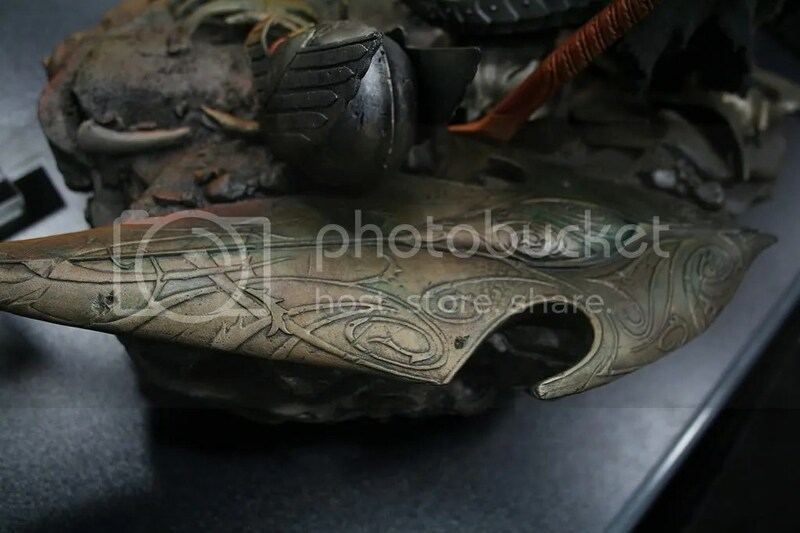 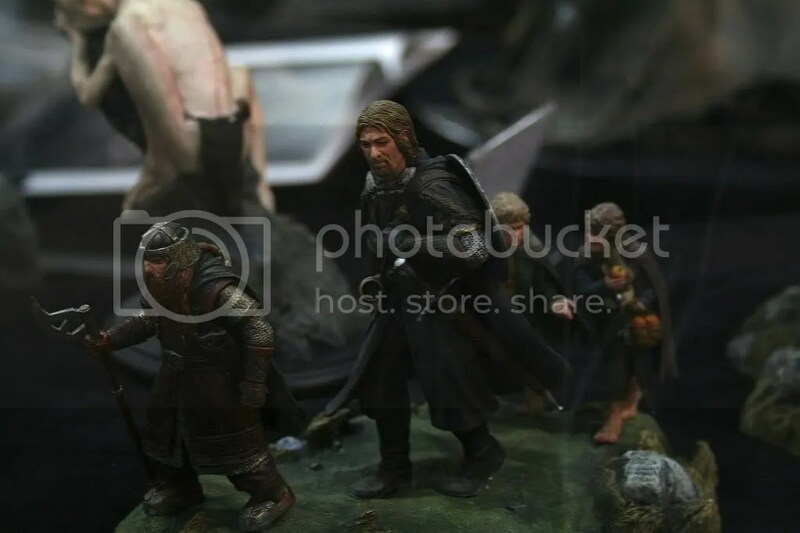 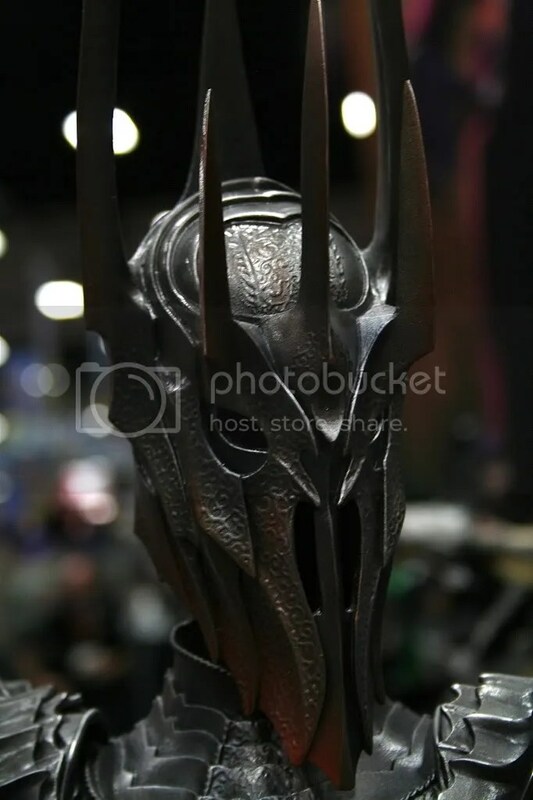 Weta Workshop at Comic-Con 2012 had several items straight from Middle-Earth. 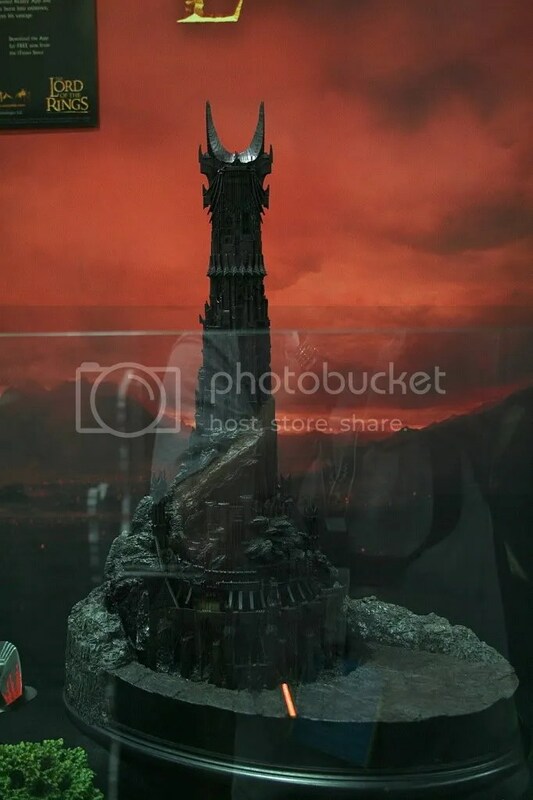 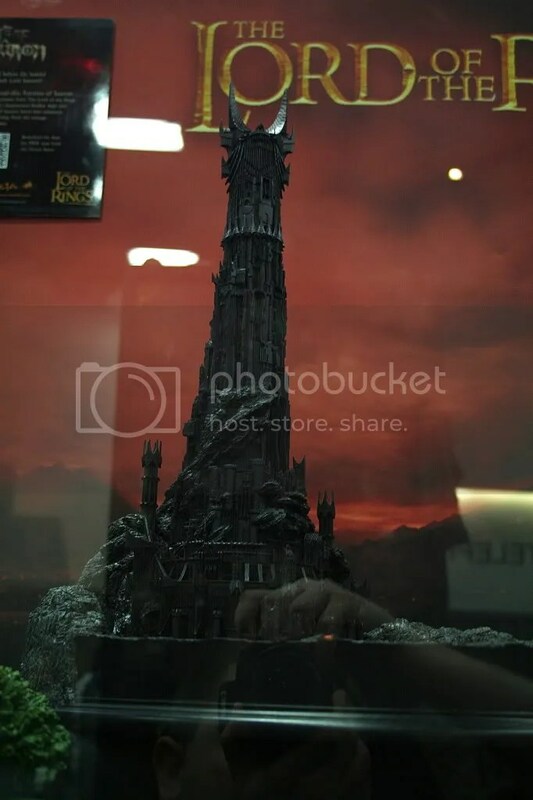 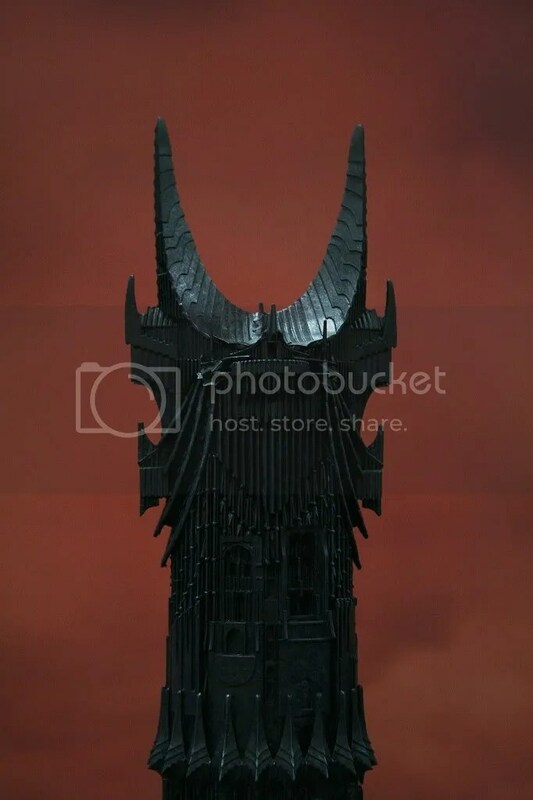 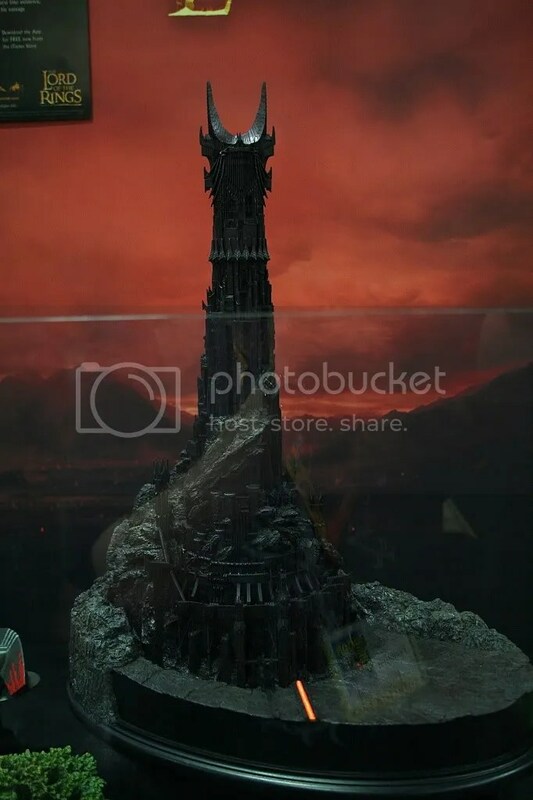 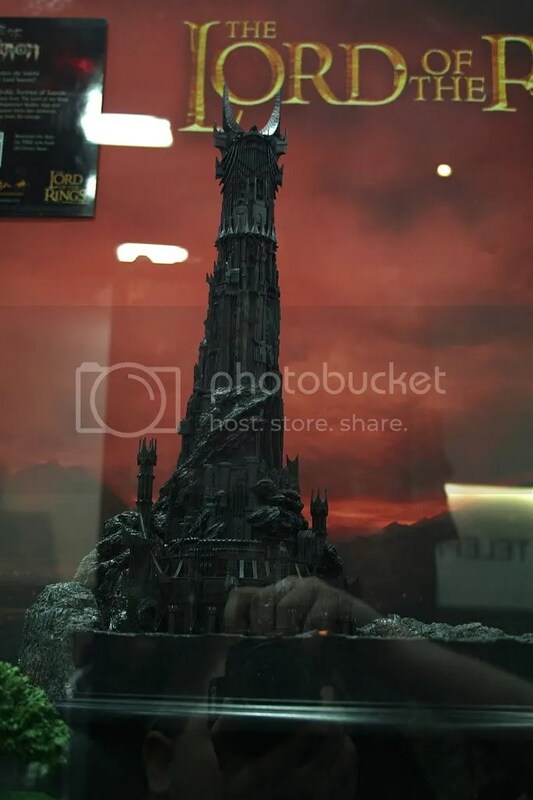 Some of their eye popping The Lord of the Rings items included the much anticipated Fellowship diorama series and the truly amazing looking Barad-Dur environment. 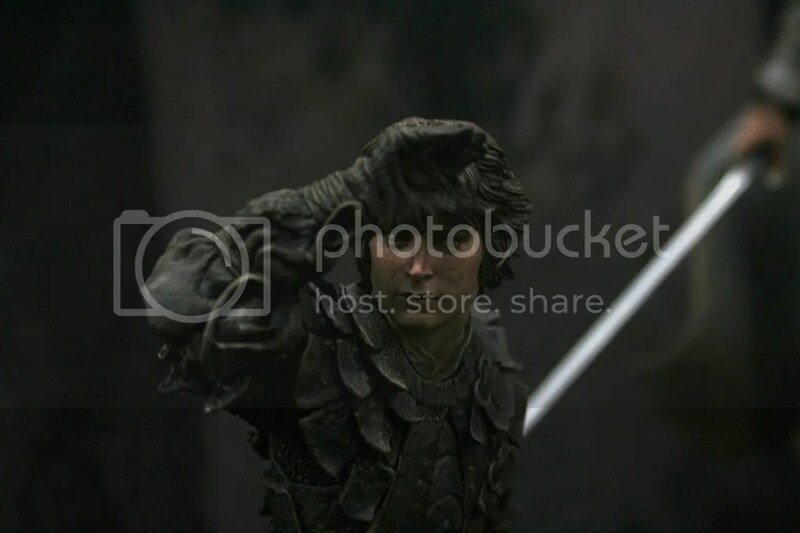 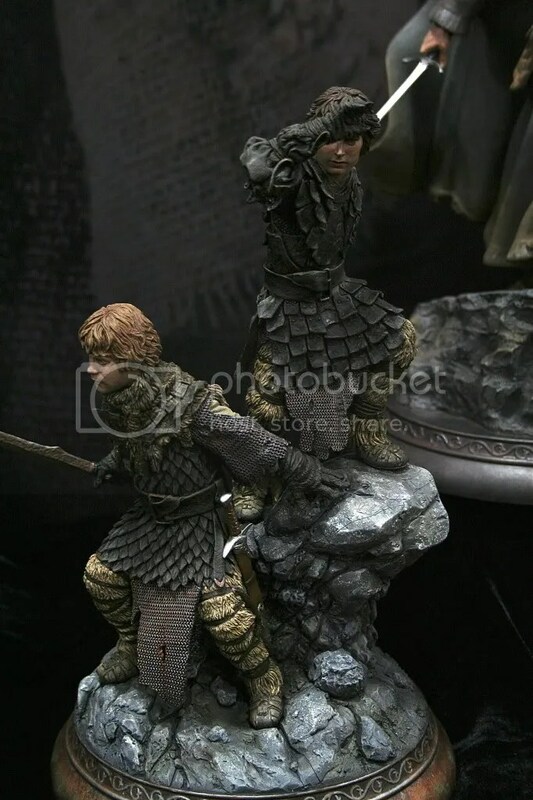 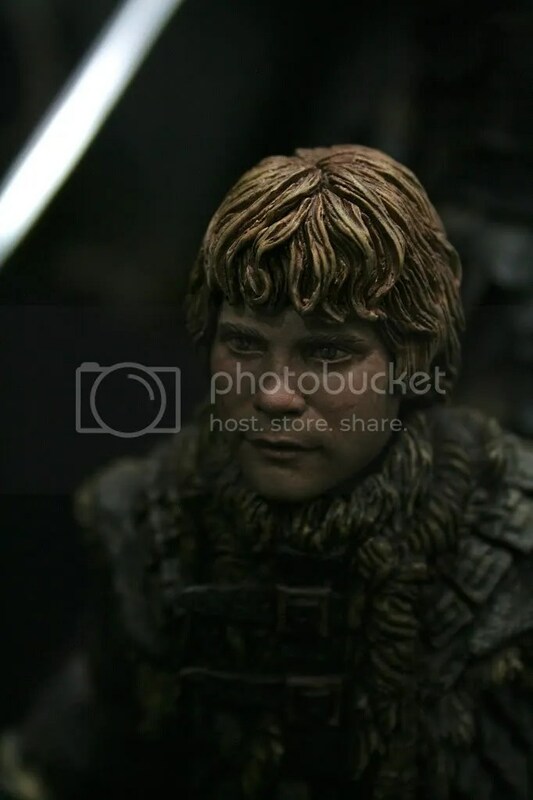 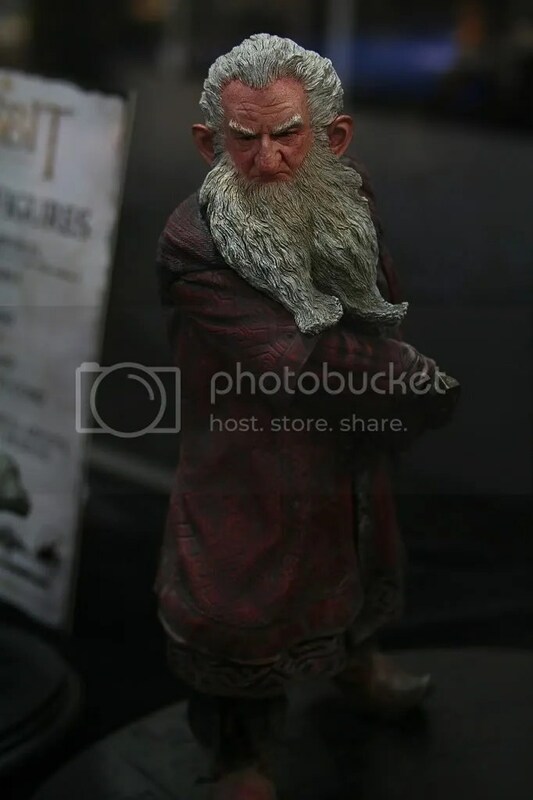 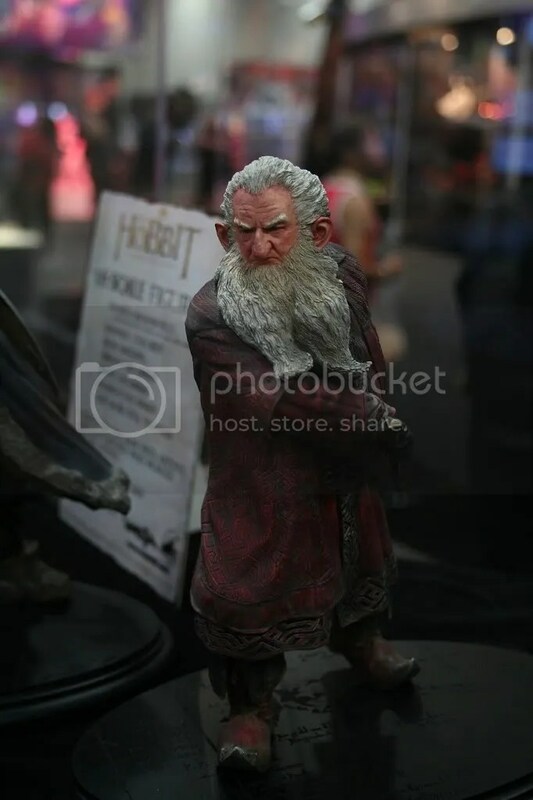 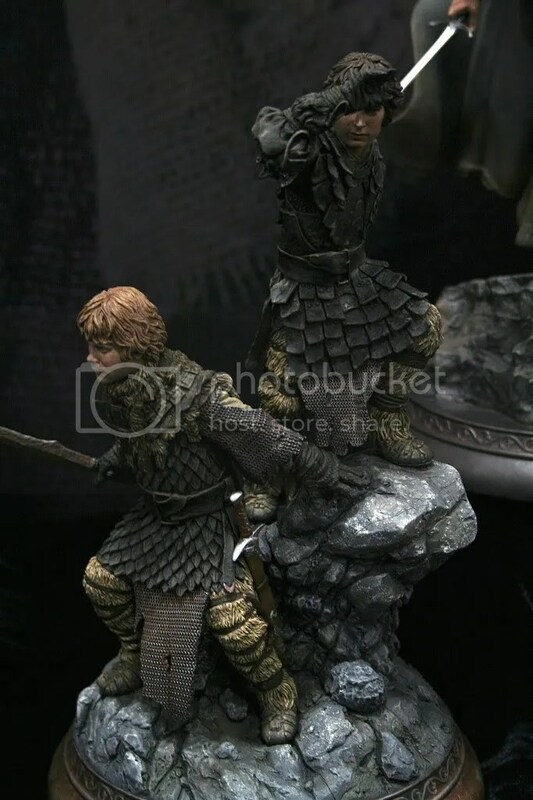 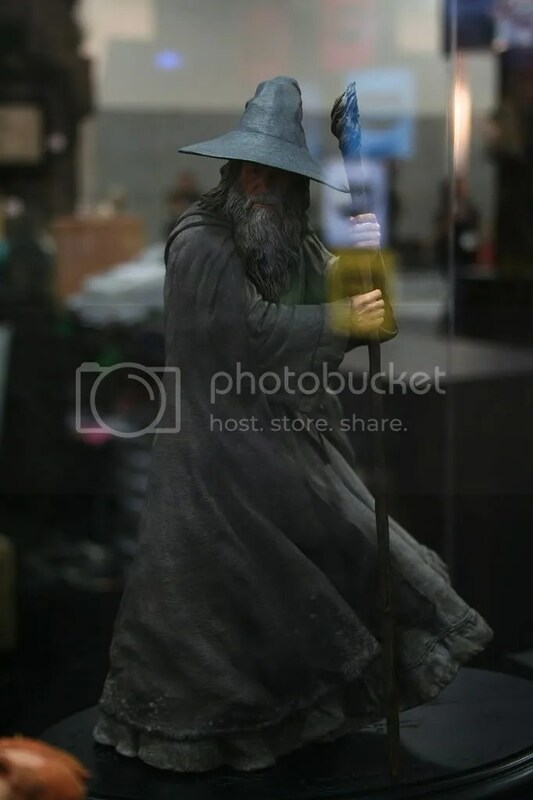 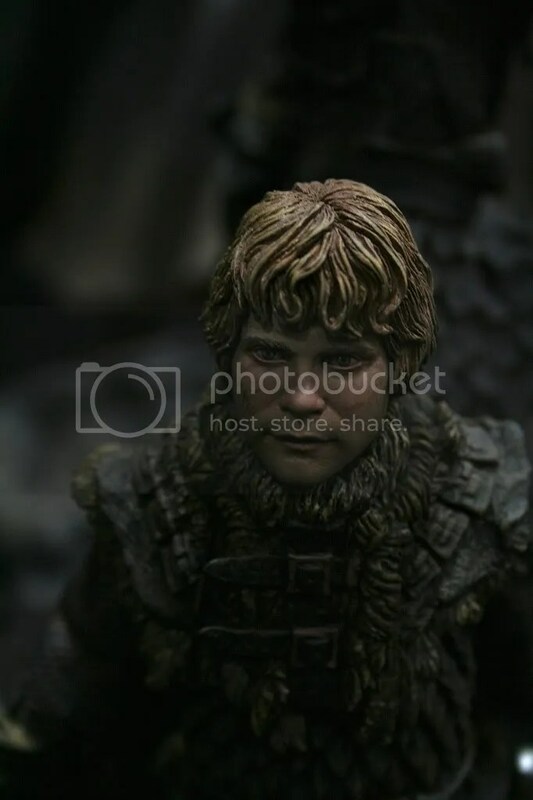 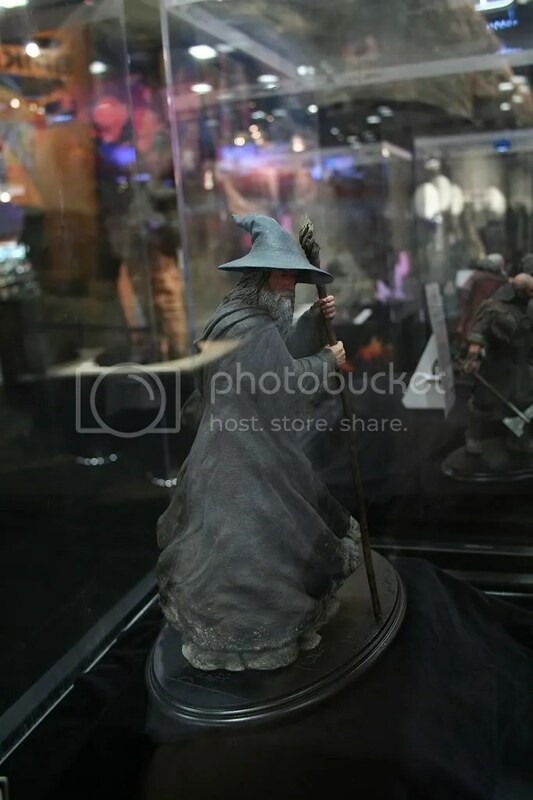 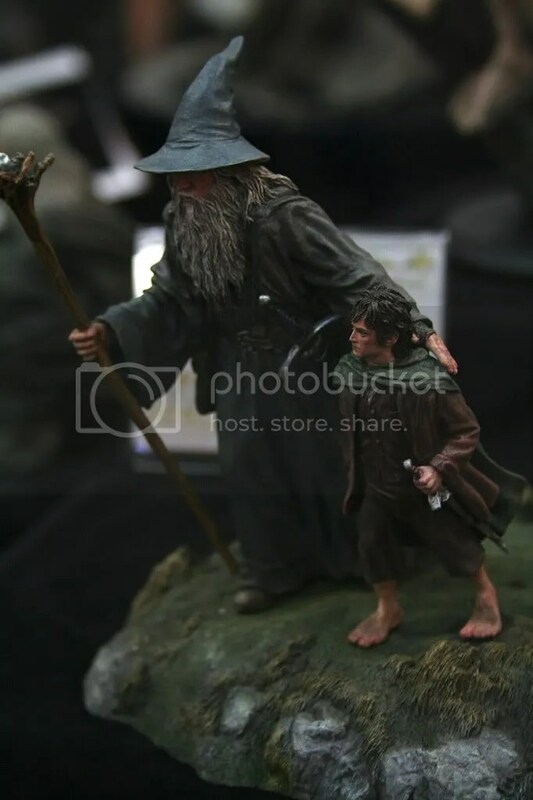 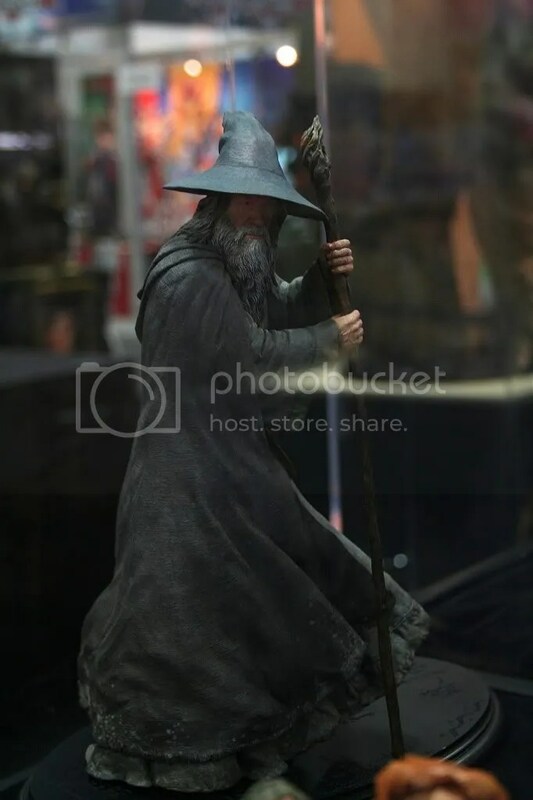 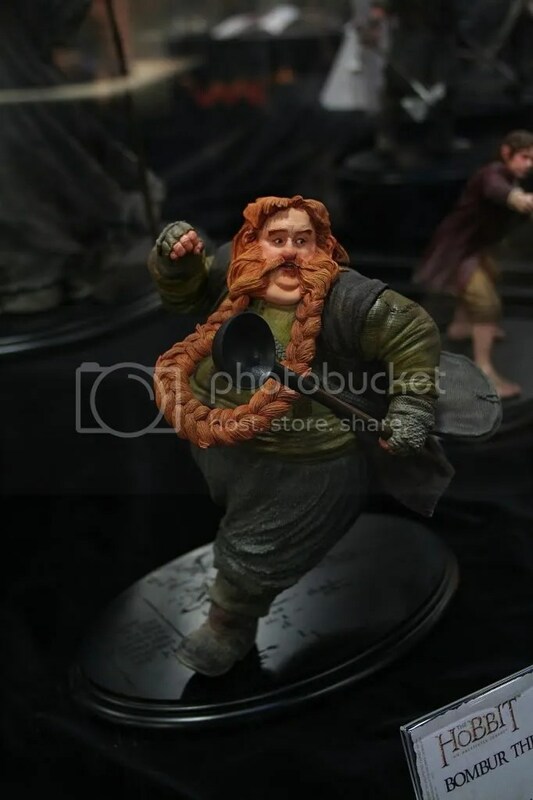 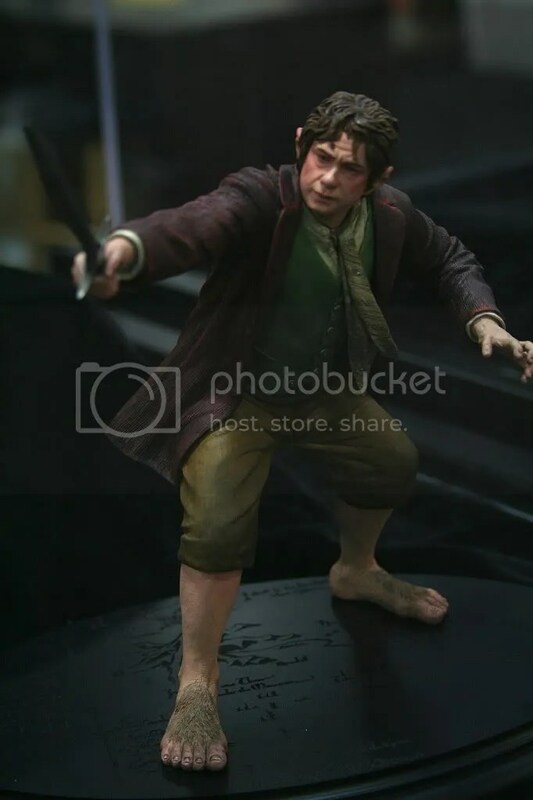 Weta also introduced us to their 1:6th line of statues from the first of two films based on The Hobbit. 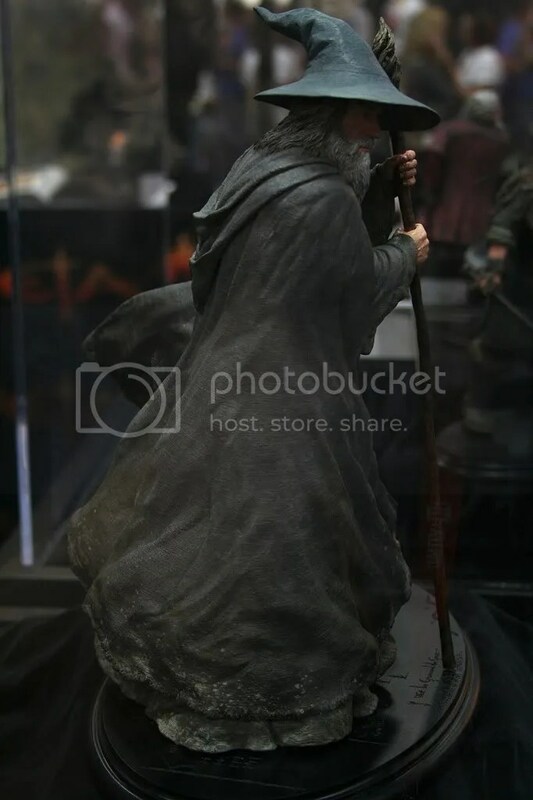 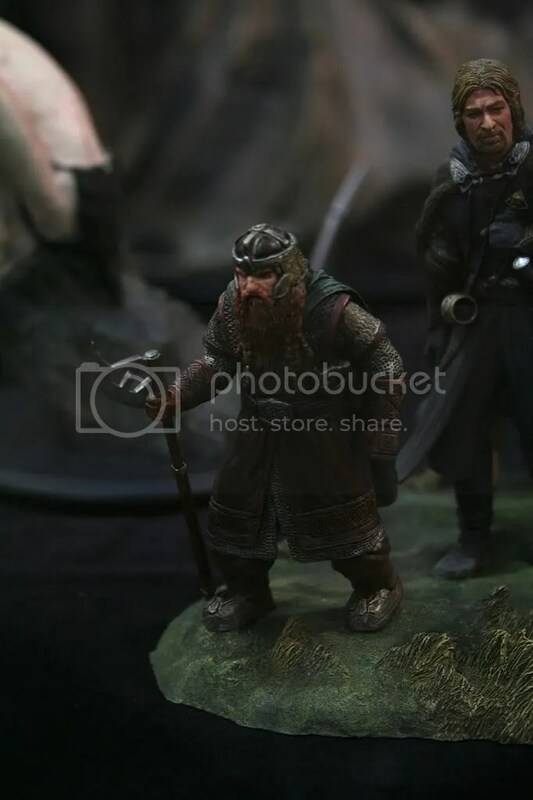 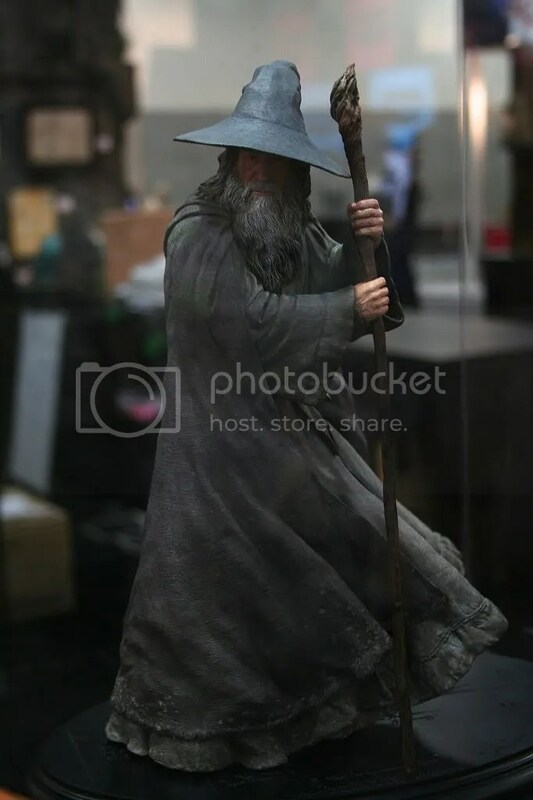 Representing the start of the line you had characters such as Gandalf The Grey, Bilbo Baggins, Dwalin (my favorite), Balin, Bombur, and Thorin (Comic-Con Exclusive version). 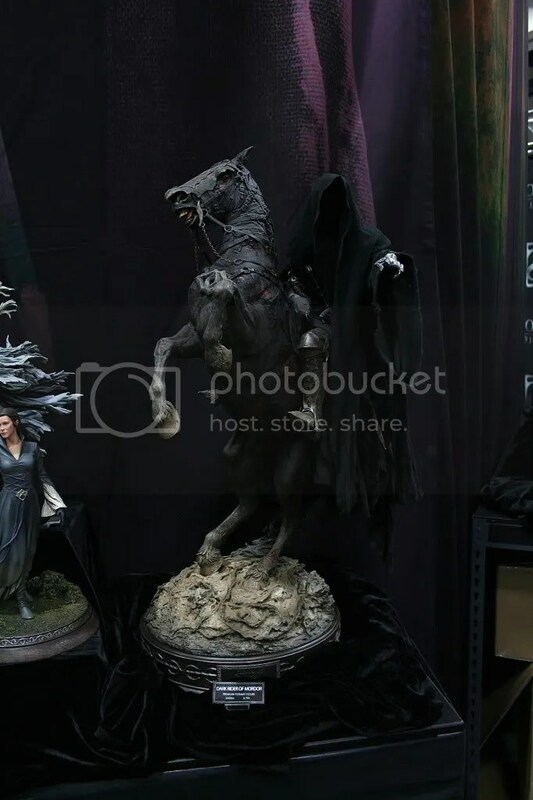 They also had some props from the film that will like these statues be up for sale come October. 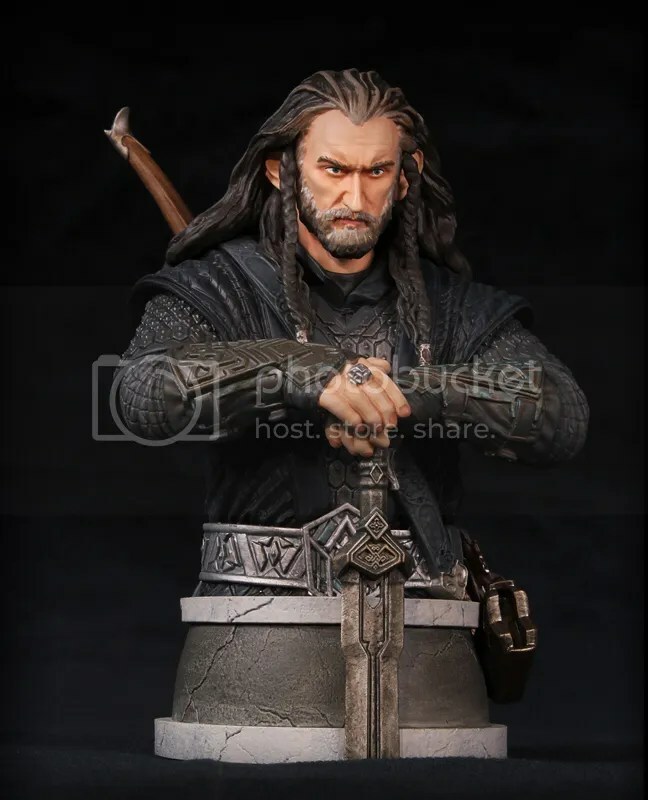 As, I just mentioned the Thorin you will see is their Comic-Con Ex version and a regular version minus a piece of his shield will be up for sale in October. 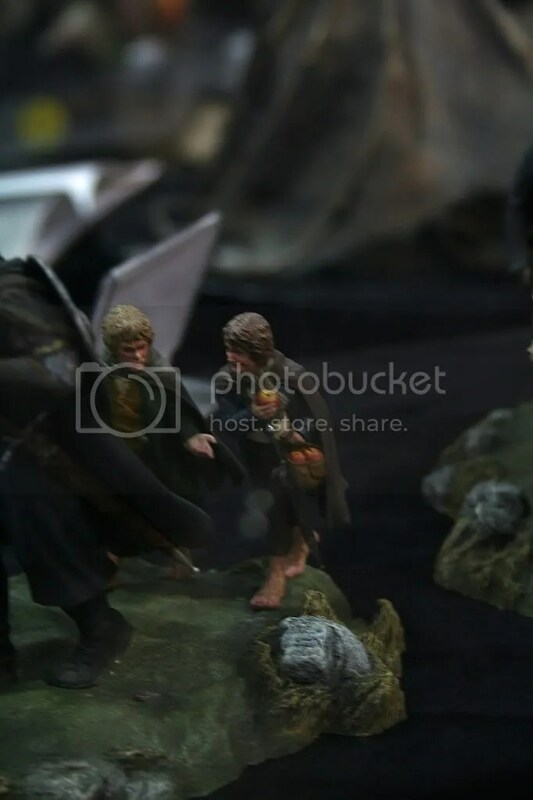 Weta had one of the coolest booths at the Con this year with all the items and the Trolls who feature in the film and The Fellowship of the Ring. 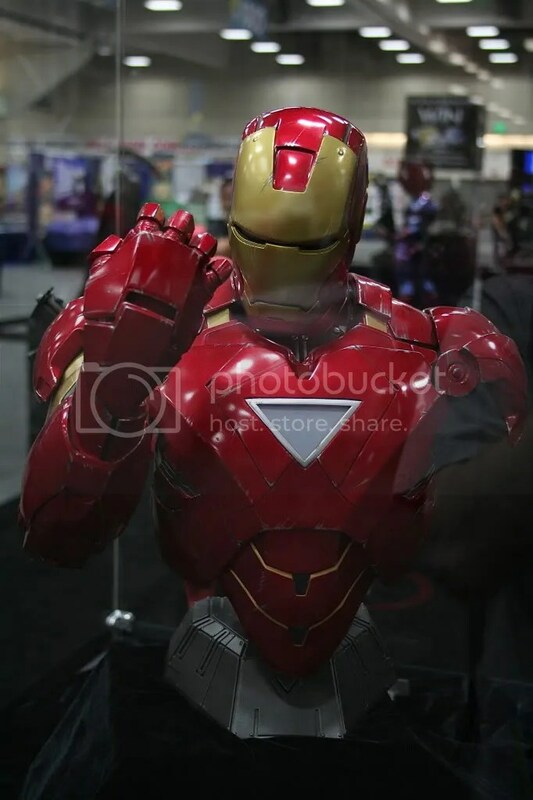 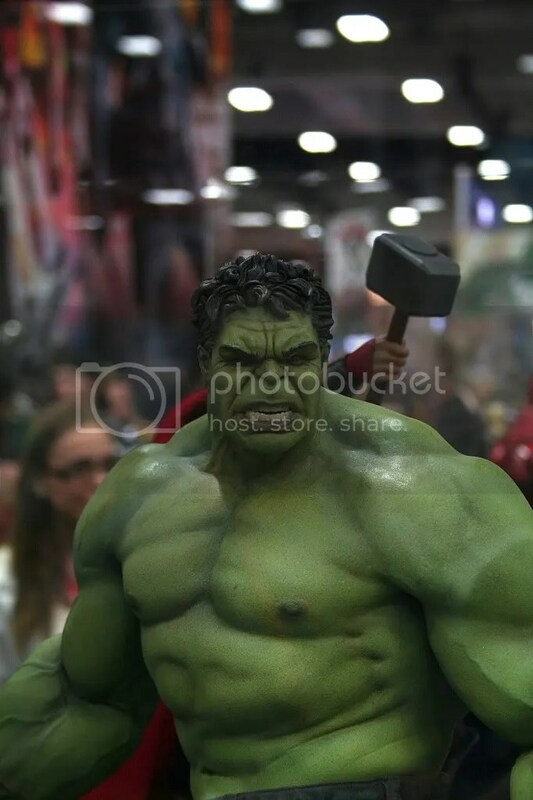 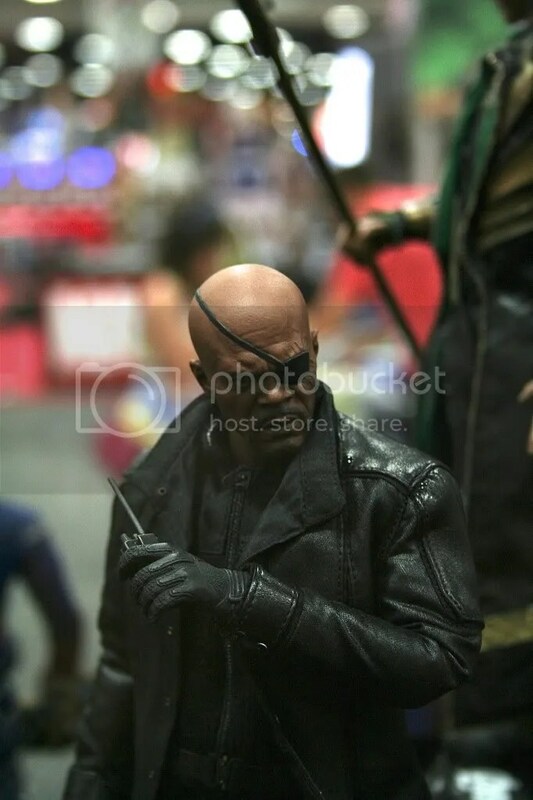 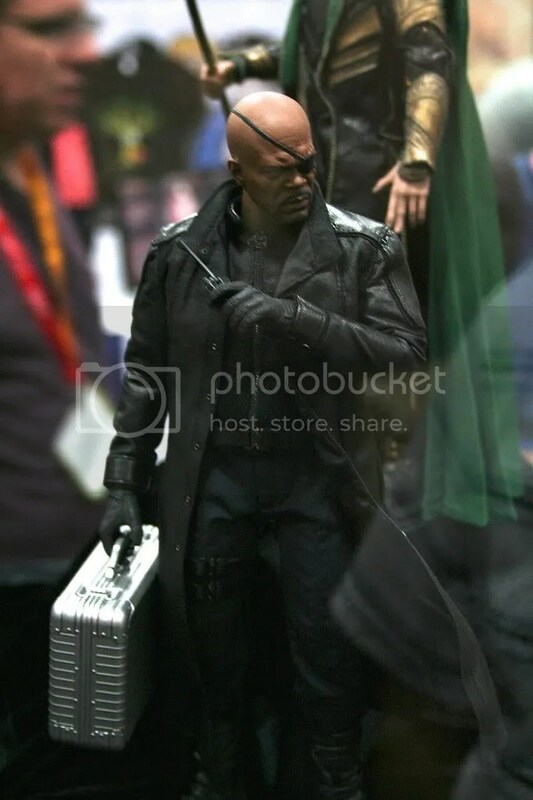 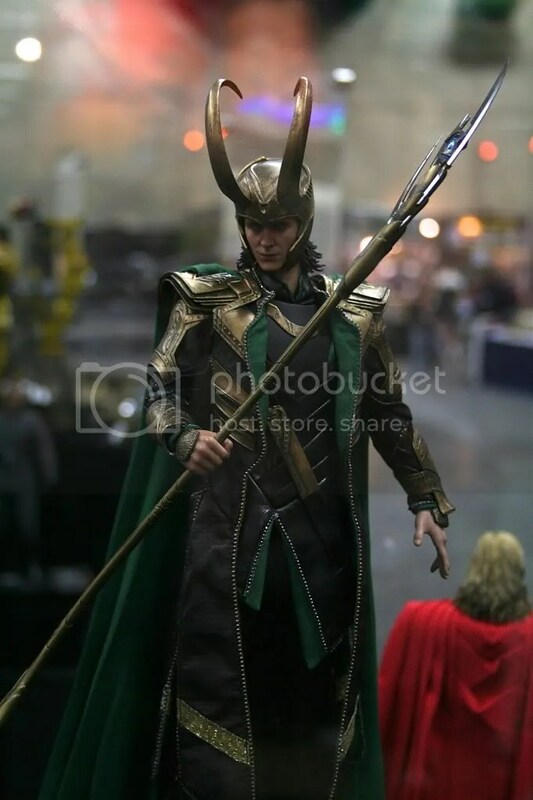 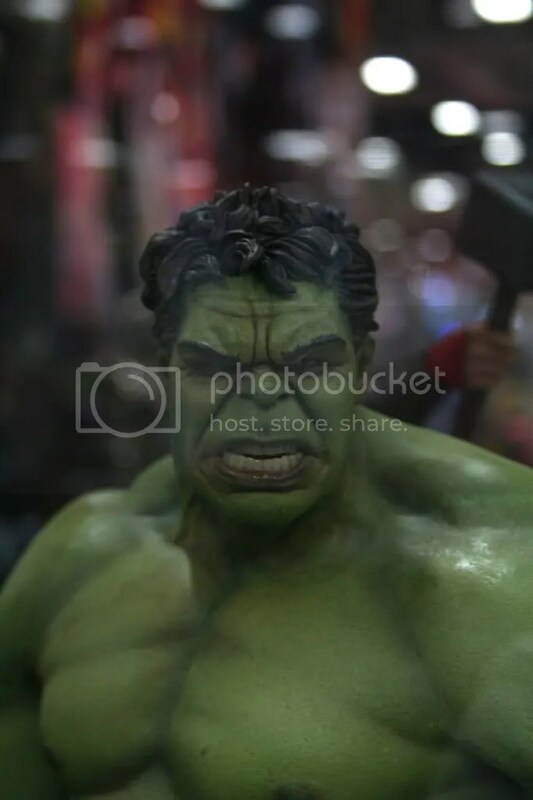 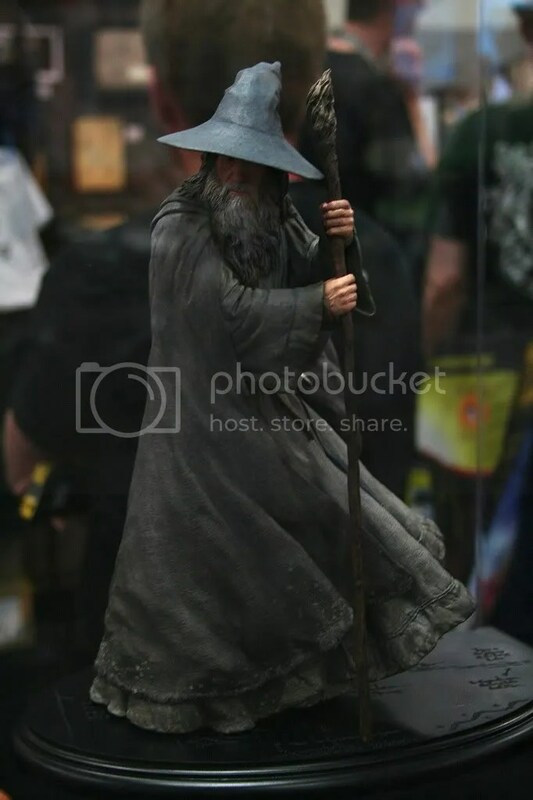 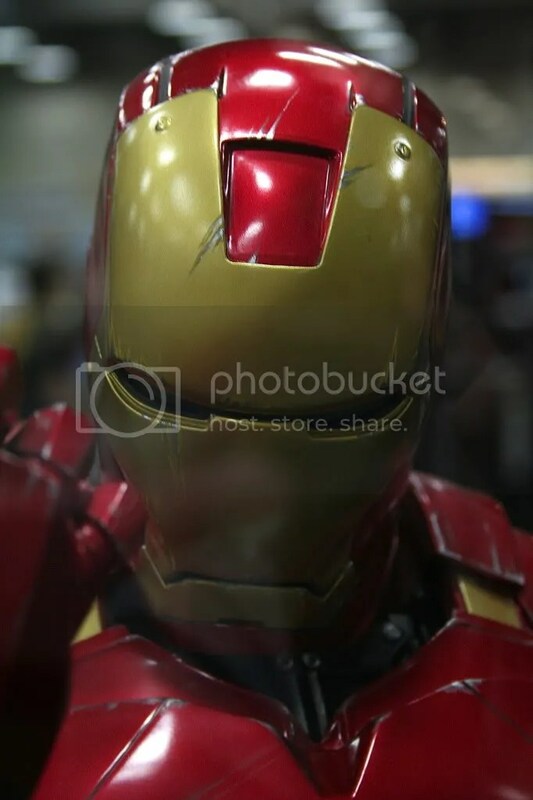 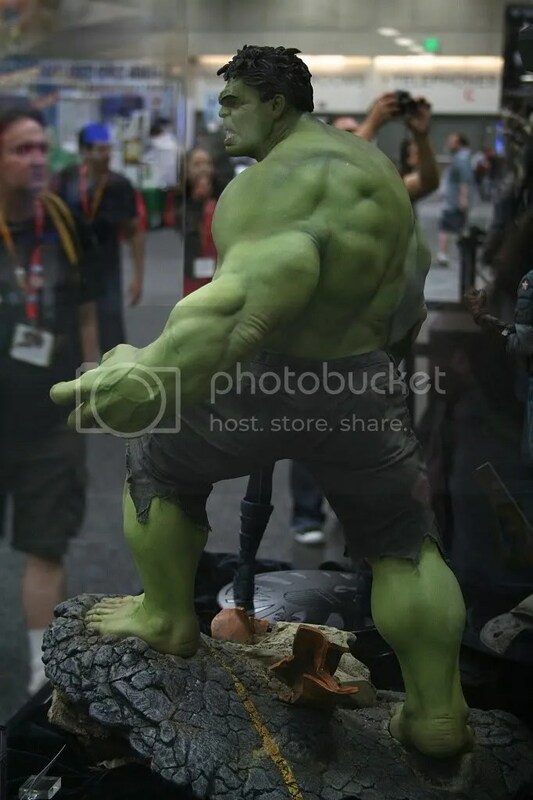 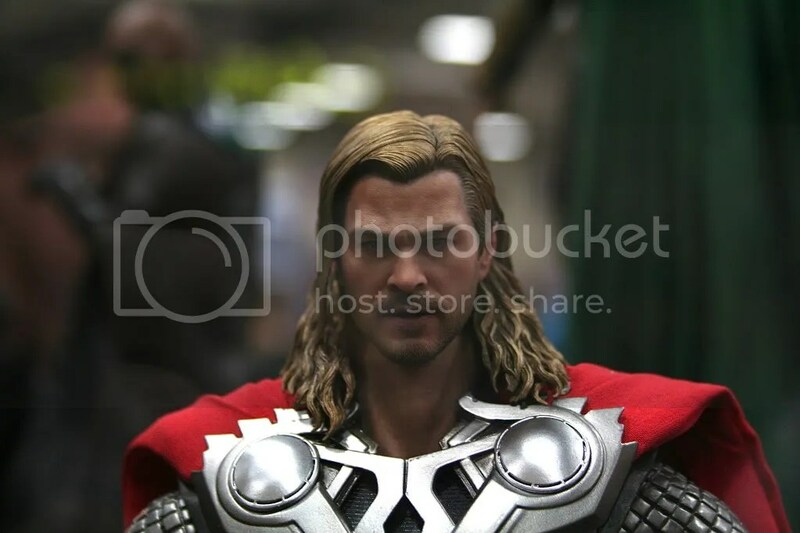 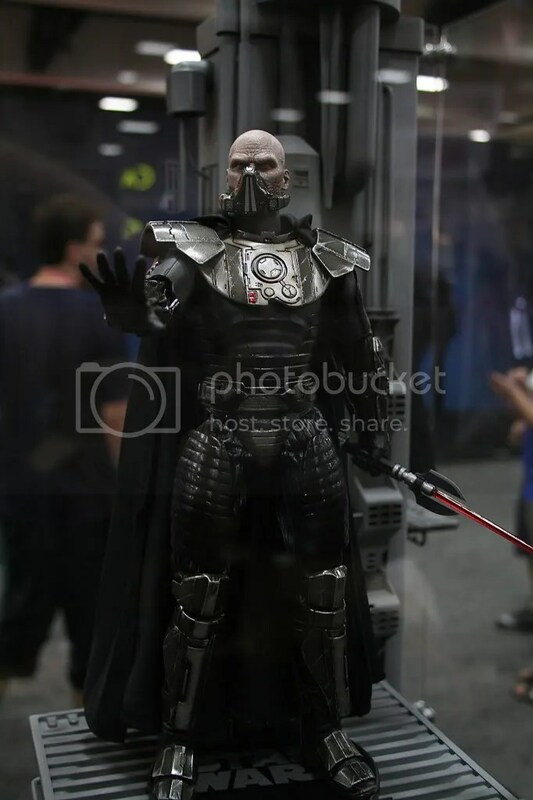 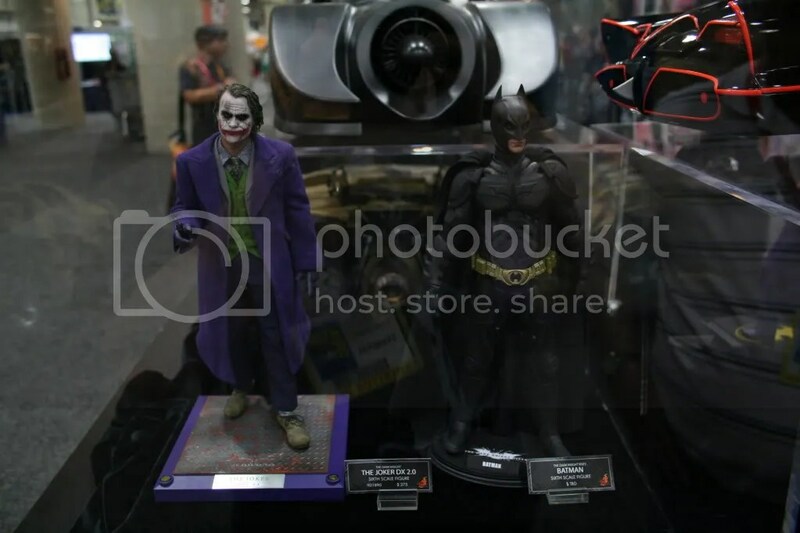 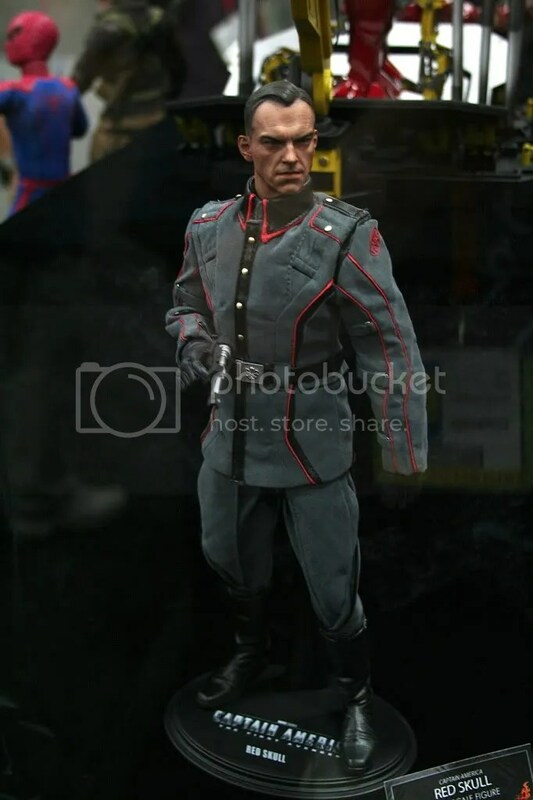 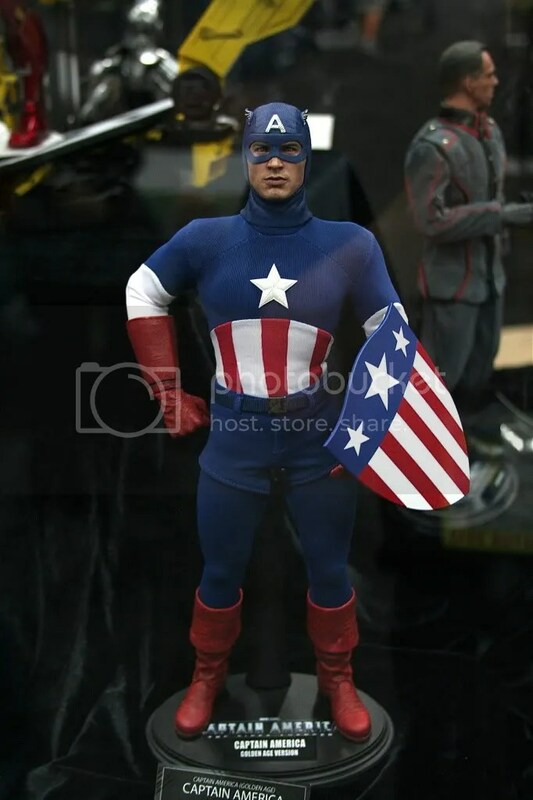 Recap #4 from Comic-Con 2012 covers the Hot Toys items from Comic-Con 2012. 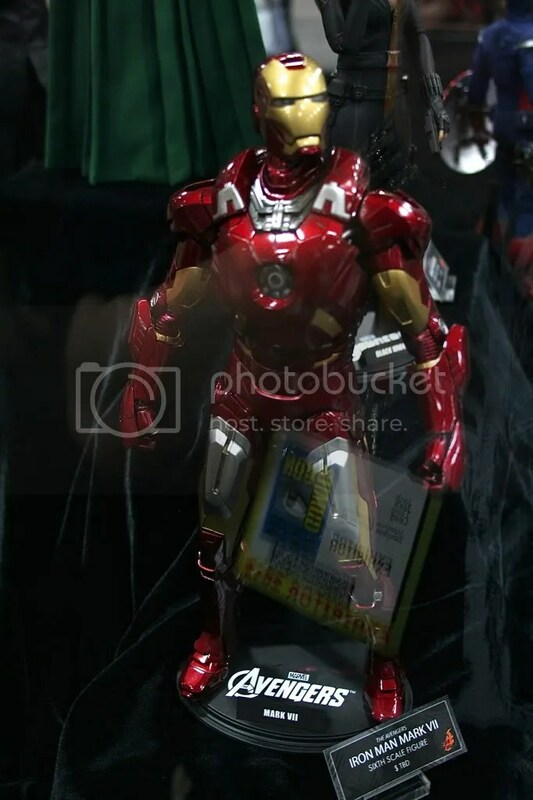 Hot Toys had all of the currently released items from The Avengers and even brought with them the new Mark VII figure. 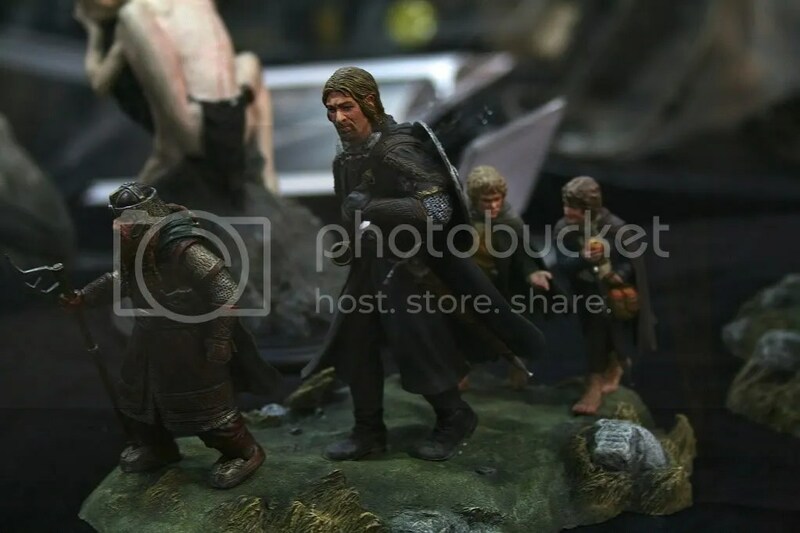 Seeing all of these characters together made me very happy that I will have several of these items in my collection. 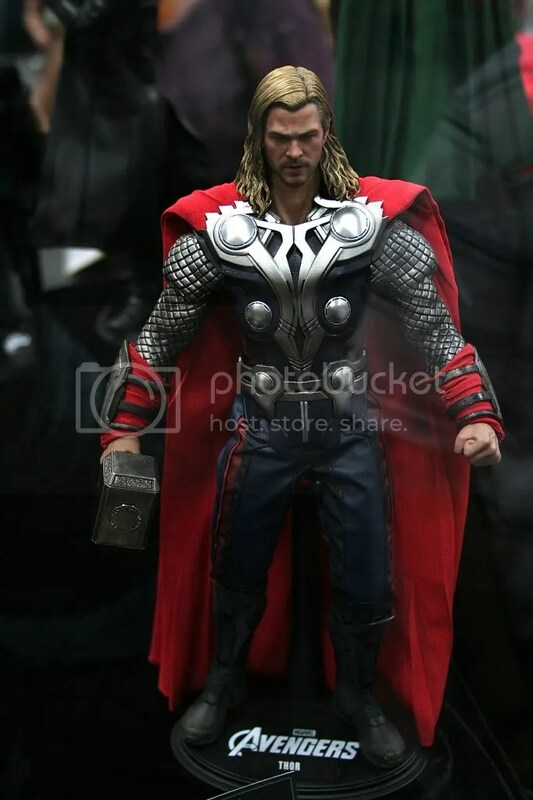 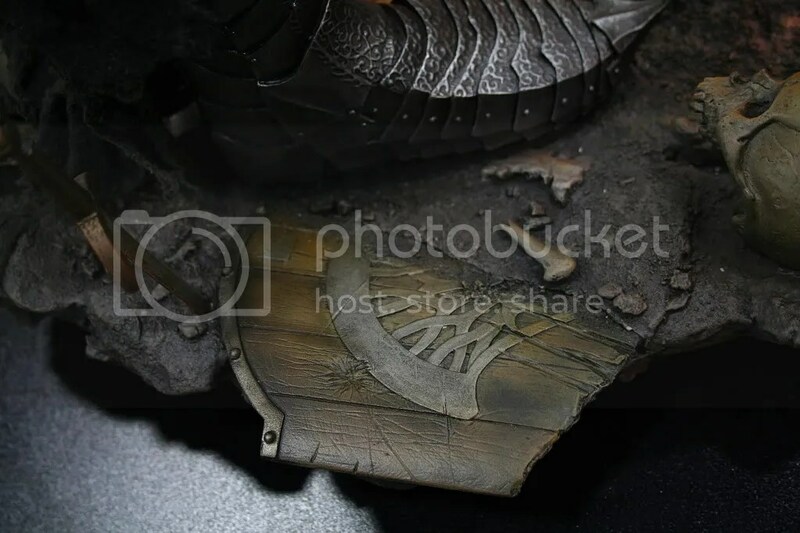 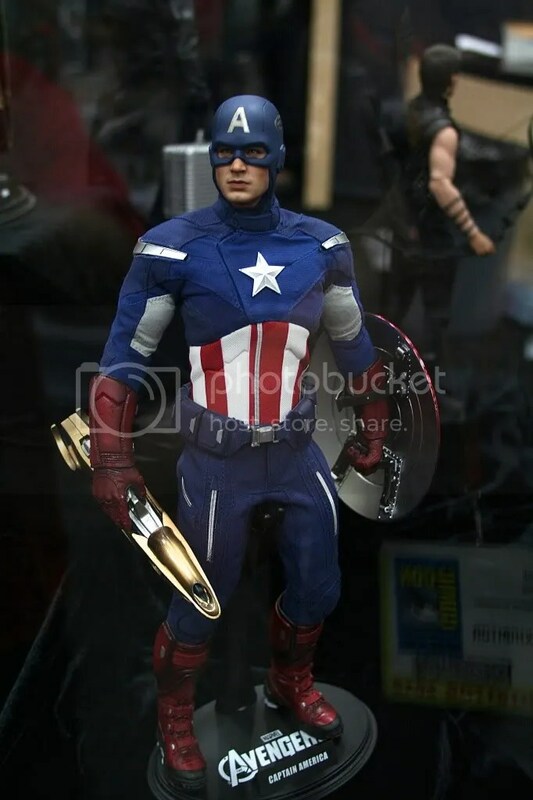 Also PreViewed on Hot Toys Facebook page fans got a chance to see two more items coming from The Avengers. 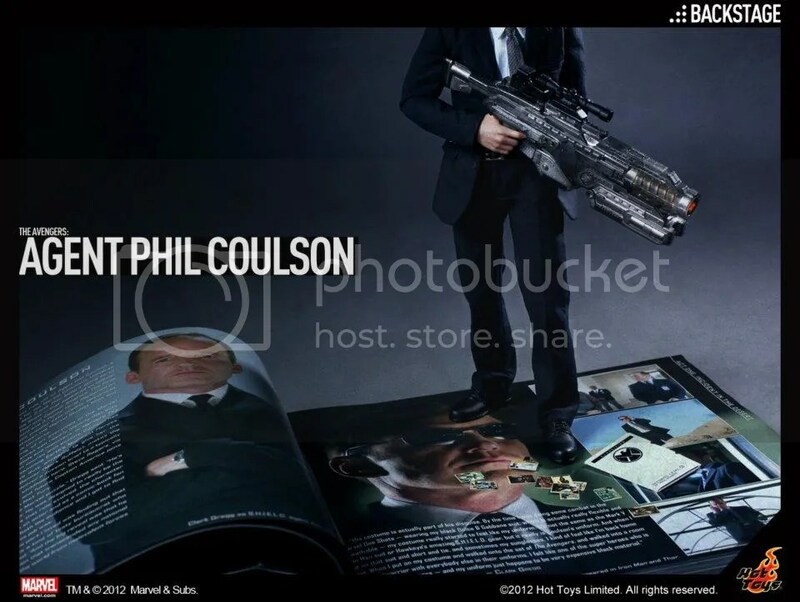 The two new items are a figure for Agent Coulson and a Chitari Footsoldier. 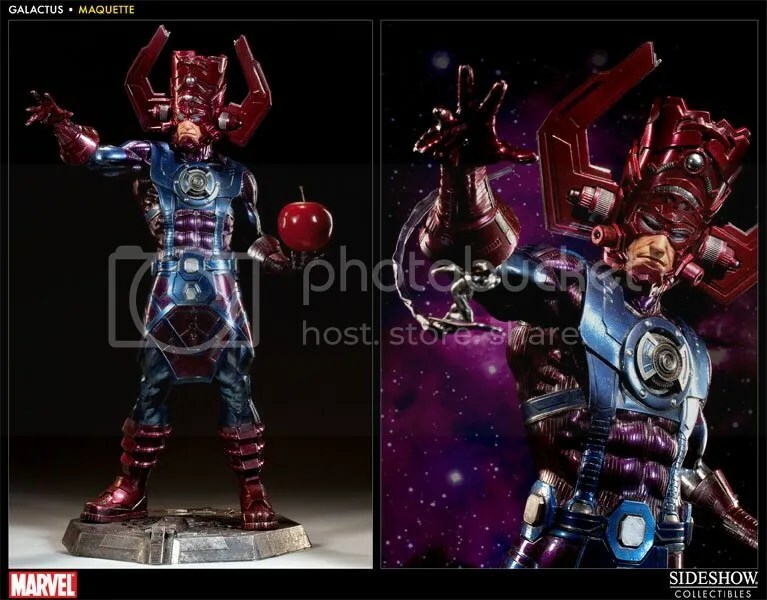 You can still Pre-Order all of these through Sideshow Collectibles by using an affiliate link. 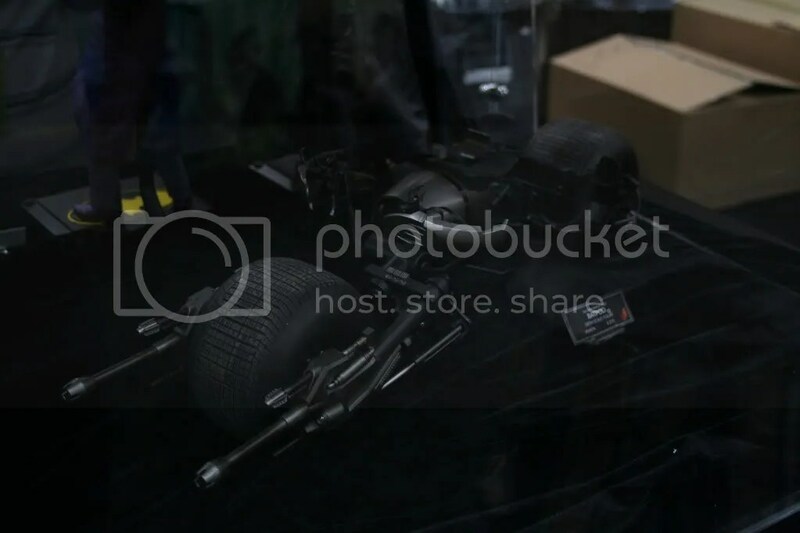 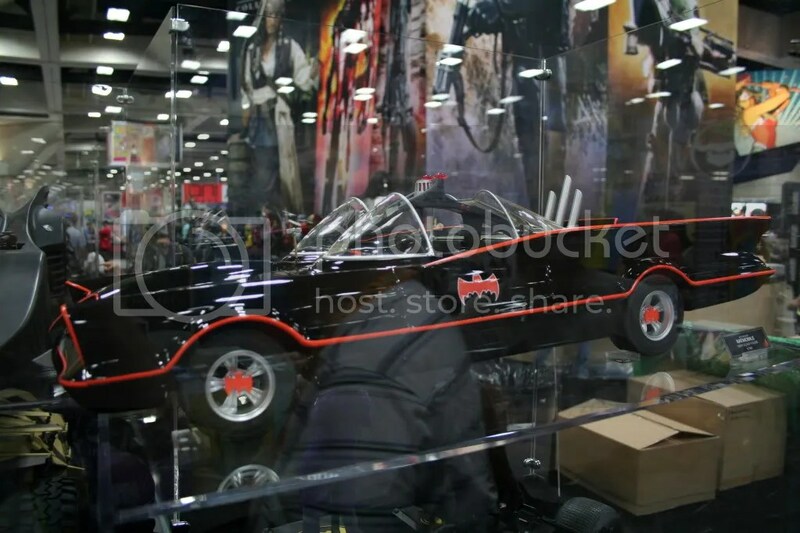 Hot Toys also had some awesome DC items there as well with their Batman figures from TDKR, TDK, and even a classic Batmobile. 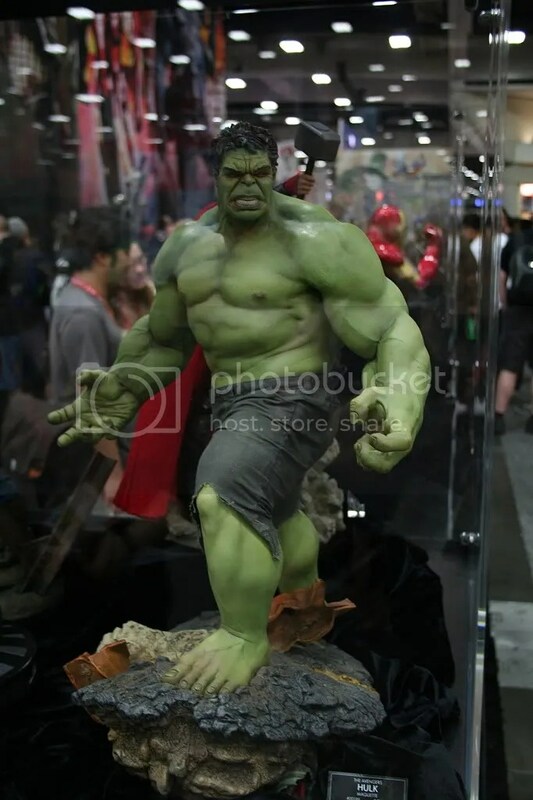 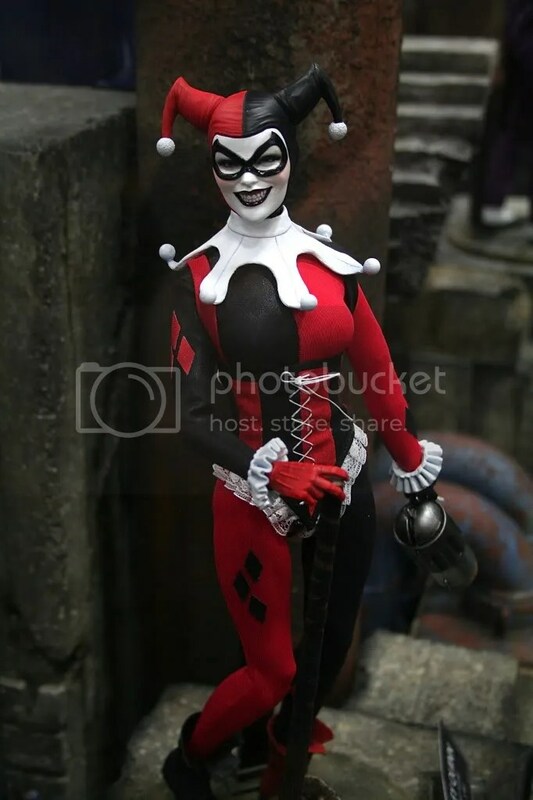 Today, I’ve got more from the Sideshow Collectibles booth with their Marvel and DC items. 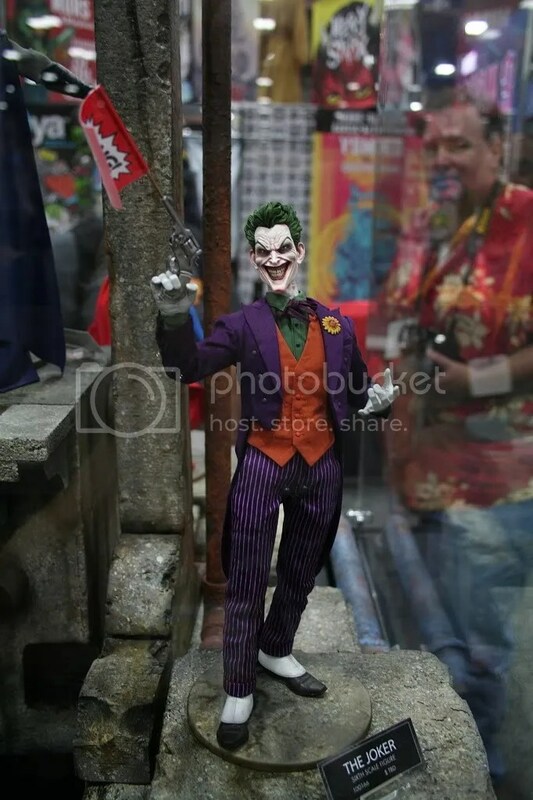 Sideshow this year showed again they’ve got the skills when it comes to Marvel and really surprised me with a DC offering that I will be getting a few from. 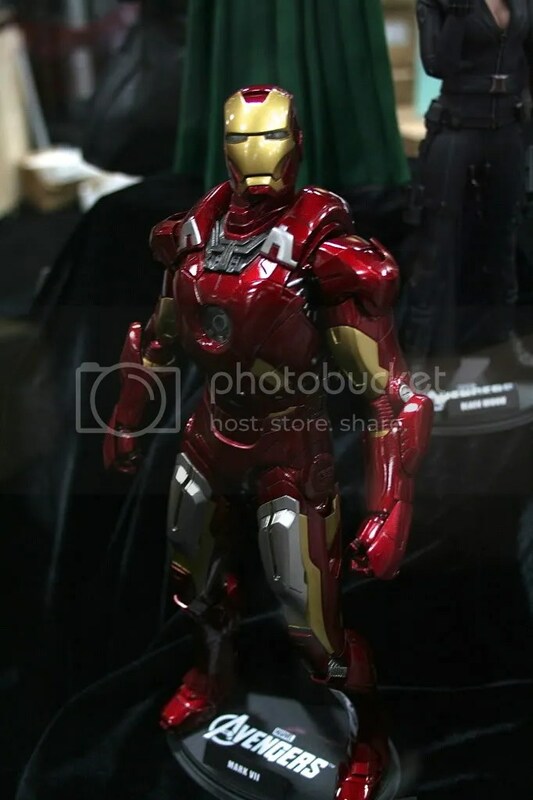 Marvel wise the Iron Man Mark VI LSB was fantastic to see in person as was the Hulk Maquette from The Avengers. 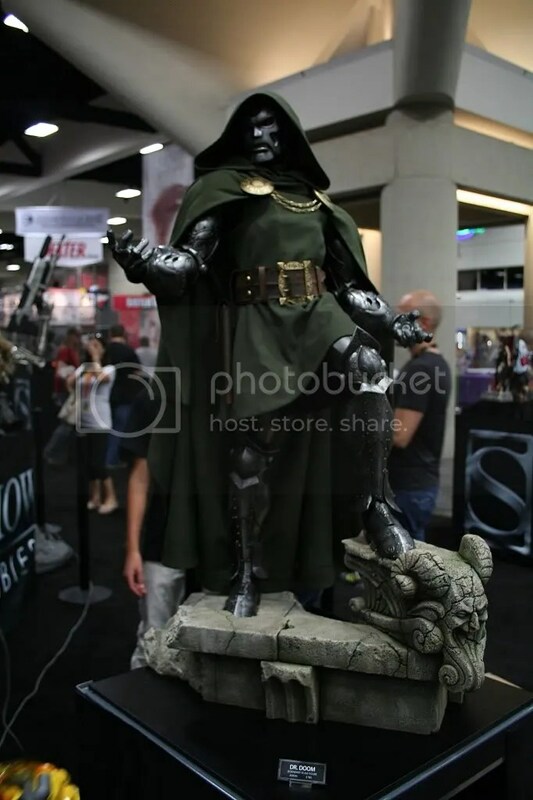 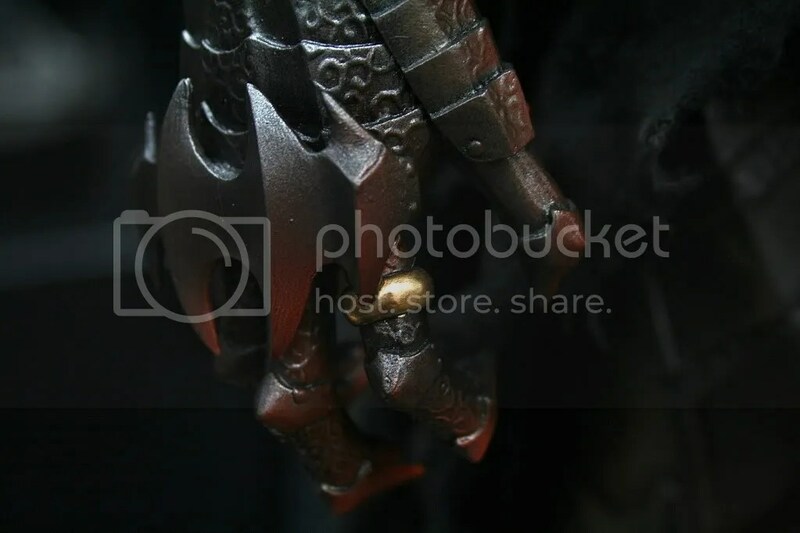 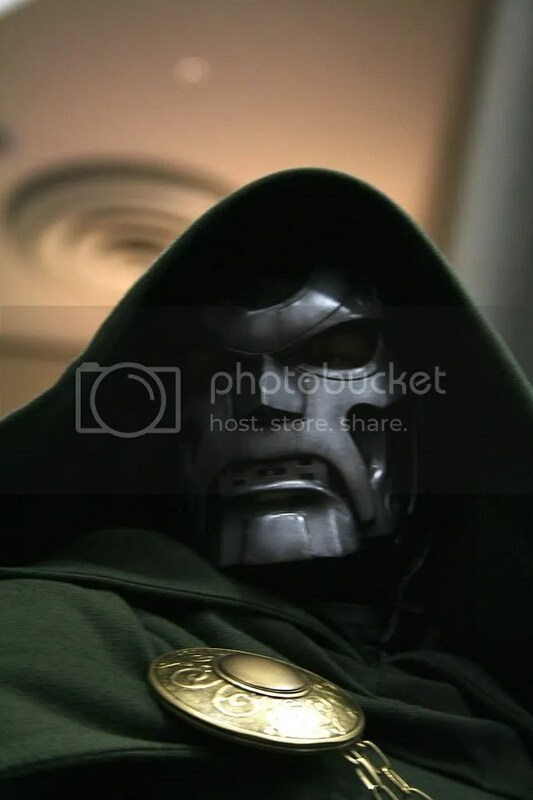 Maybe the most impressive Marvel piece though was the LSF of Dr. Doom himself and has been shown on Sideshow site this item will have switch out sculpts. 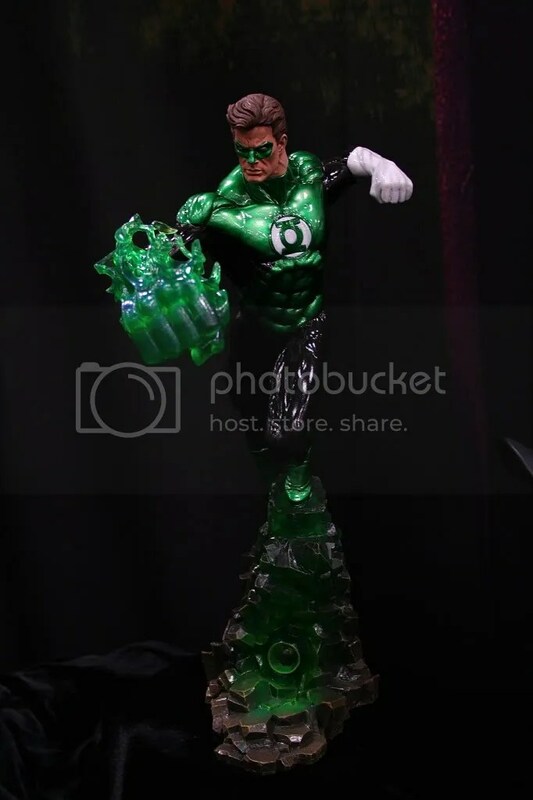 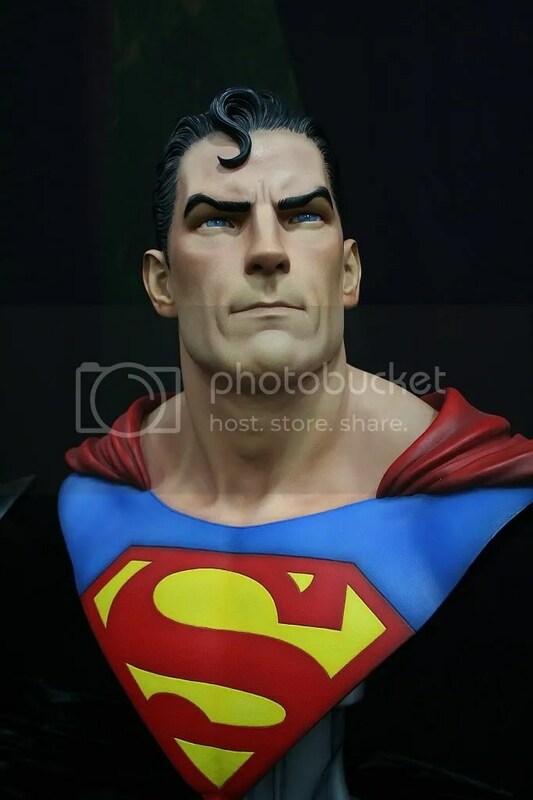 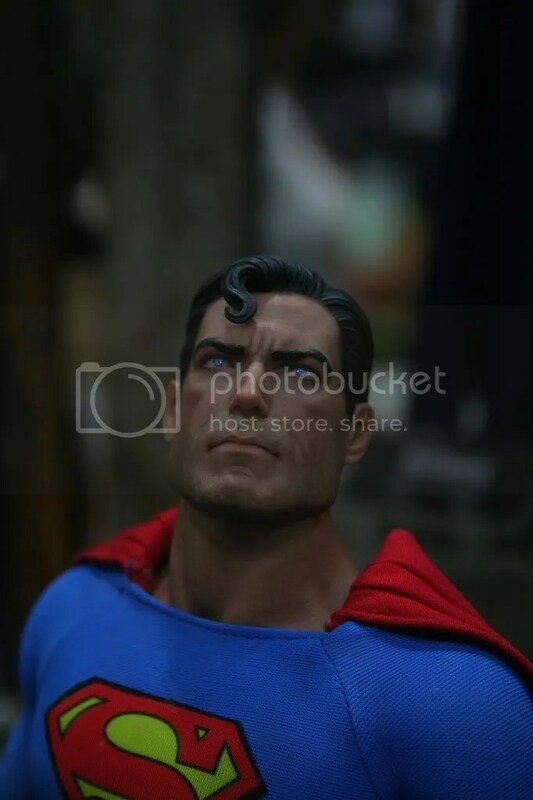 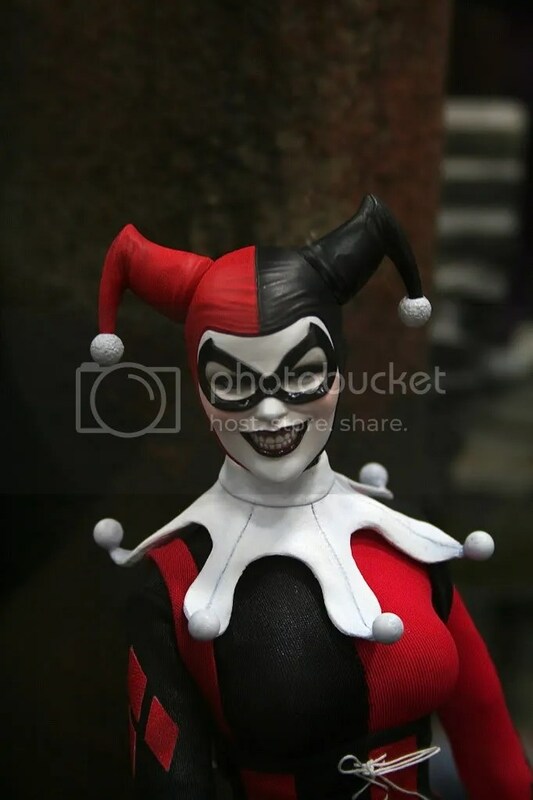 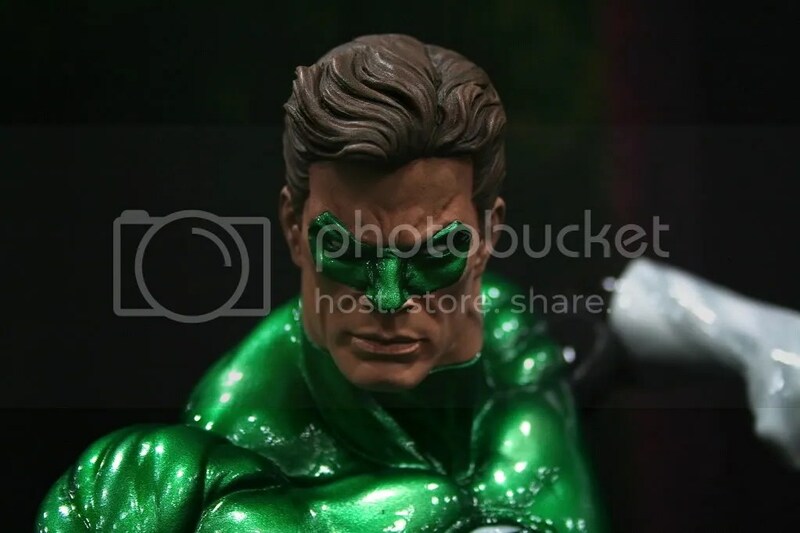 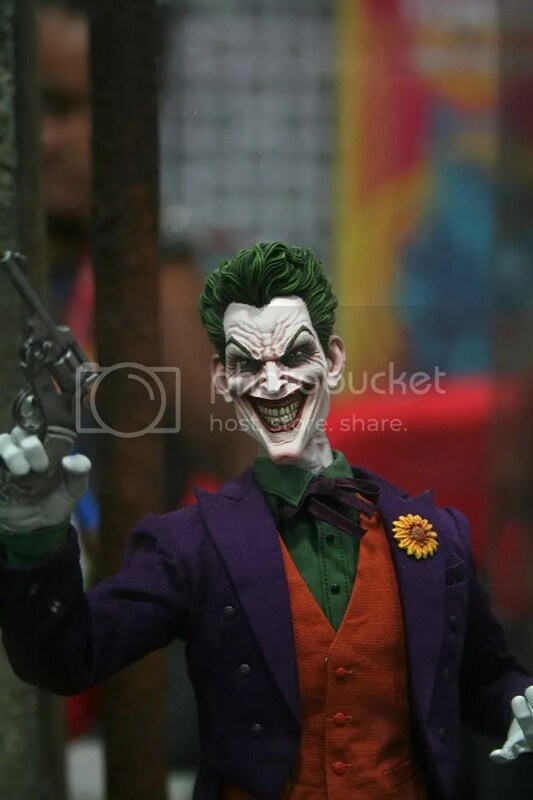 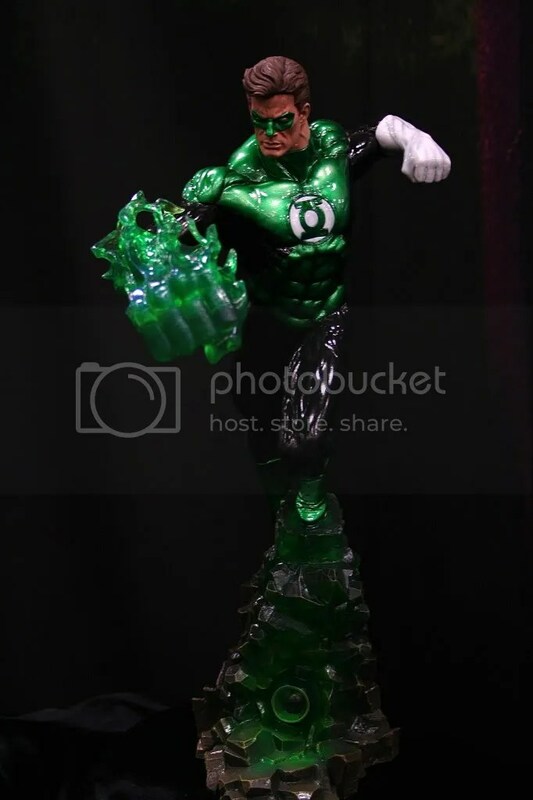 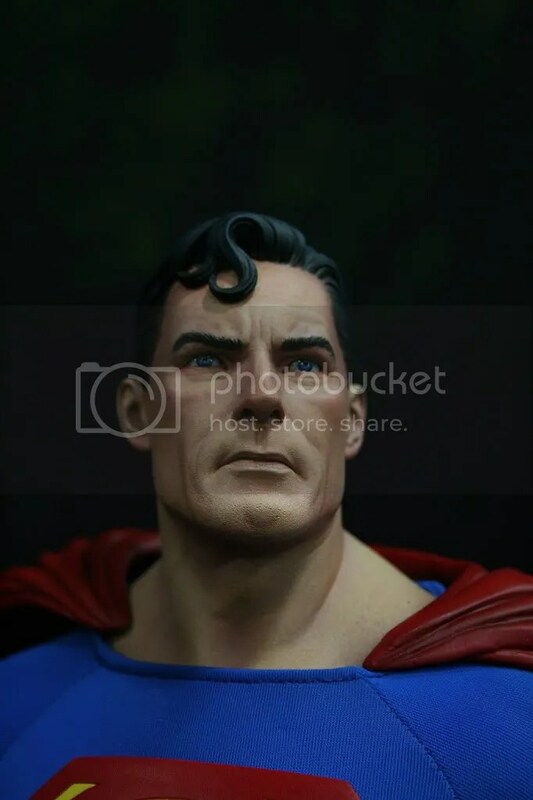 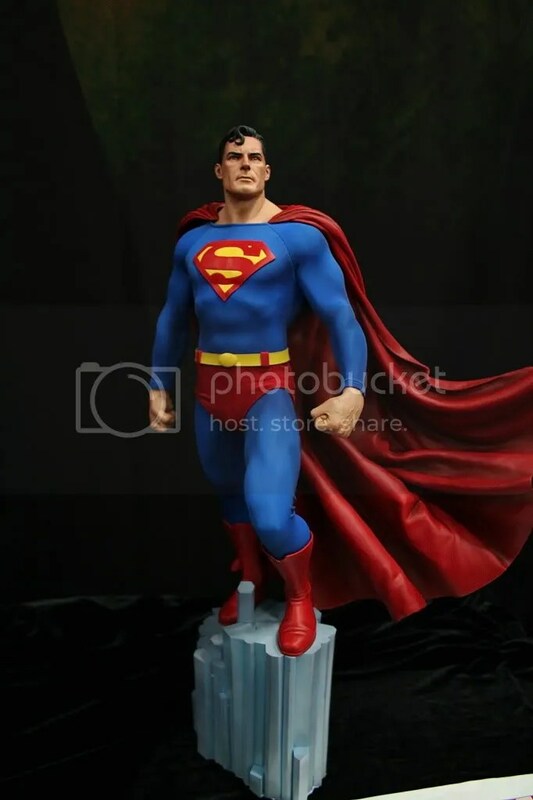 DC fans should be jumping for joy with the items that Sideshow had at Comic-Con with the Superman 1:1 bust, Superman PF, Batman PF, Green Lantern PF, and the amazing 1:6th figures Sideshow had on display. 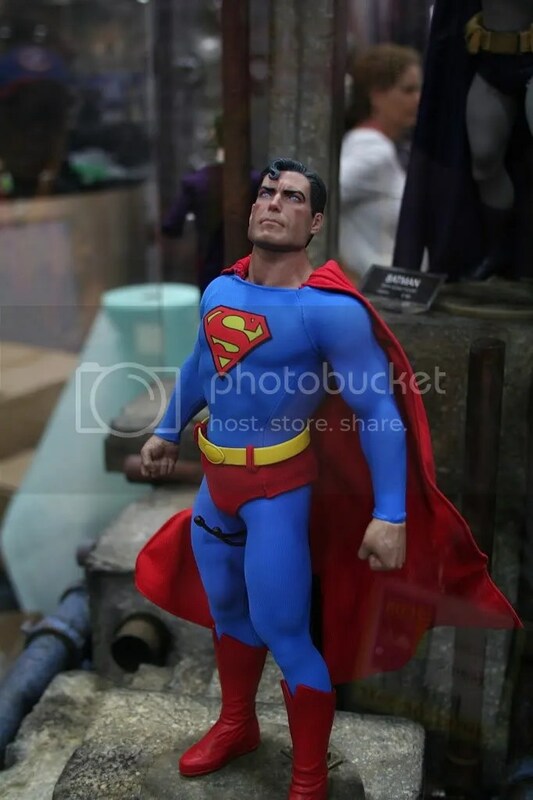 These comic based figures are a must if you’re a fan of these characters. 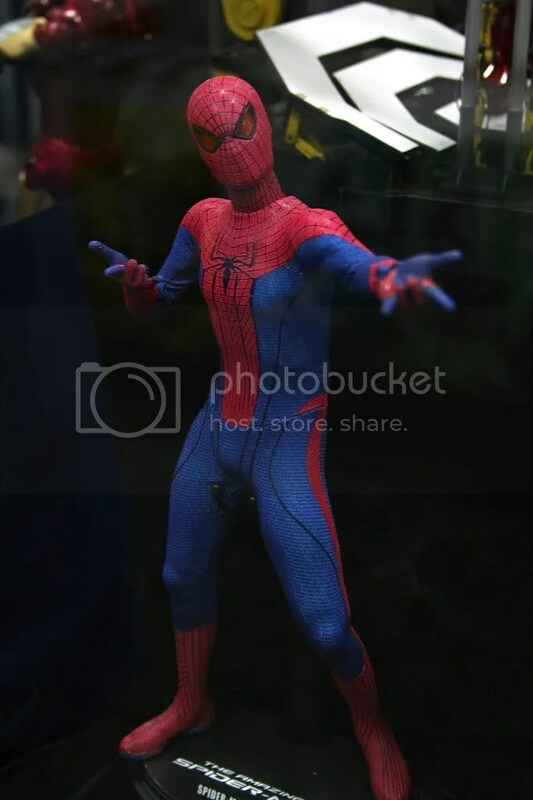 As more info is released on them I will make sure you know. 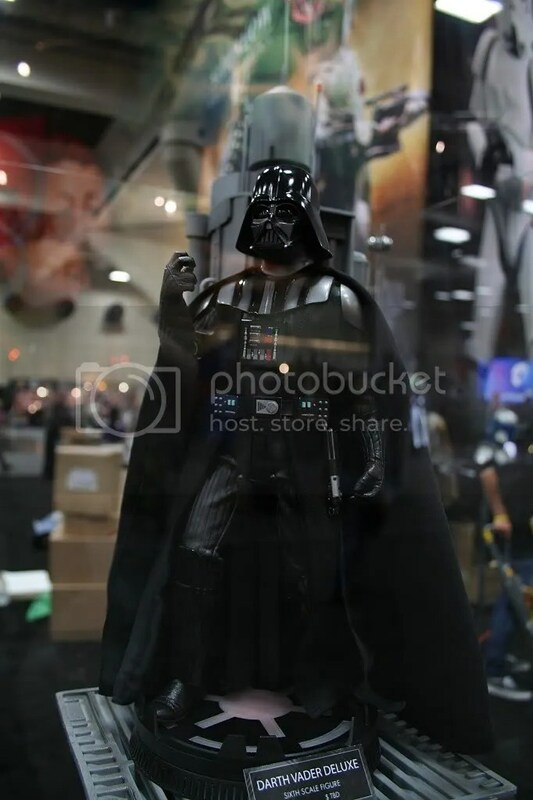 Today, I have several of the pictures I took of the various Star Wars items at the Sideshow Collectibles booth during Comic-Con 2012. 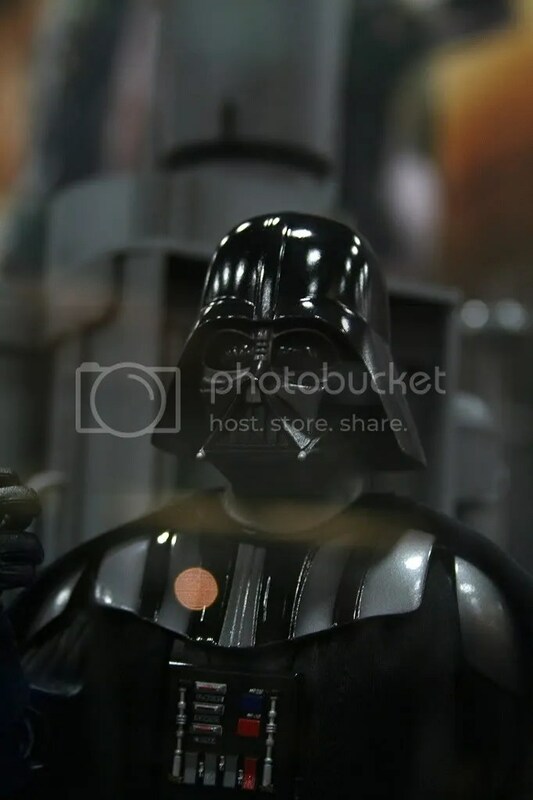 If you’re a Star Wars fan then you are in for a real treat with the number of items on display at this years show. 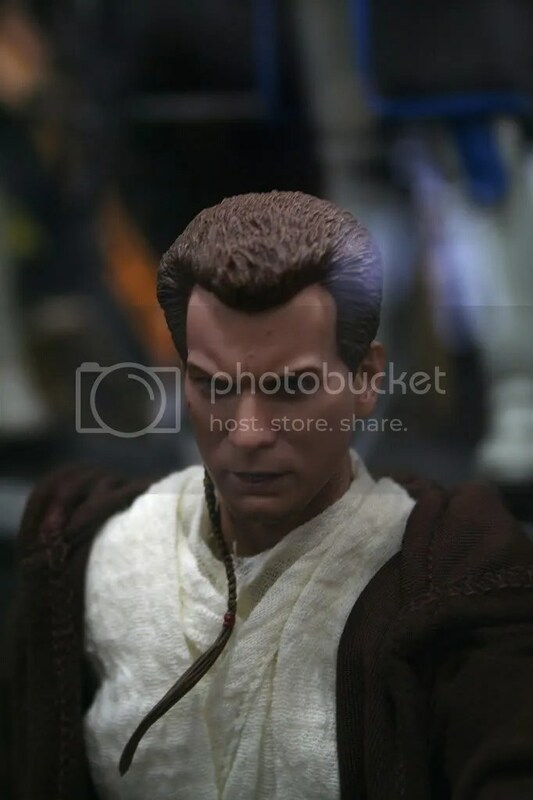 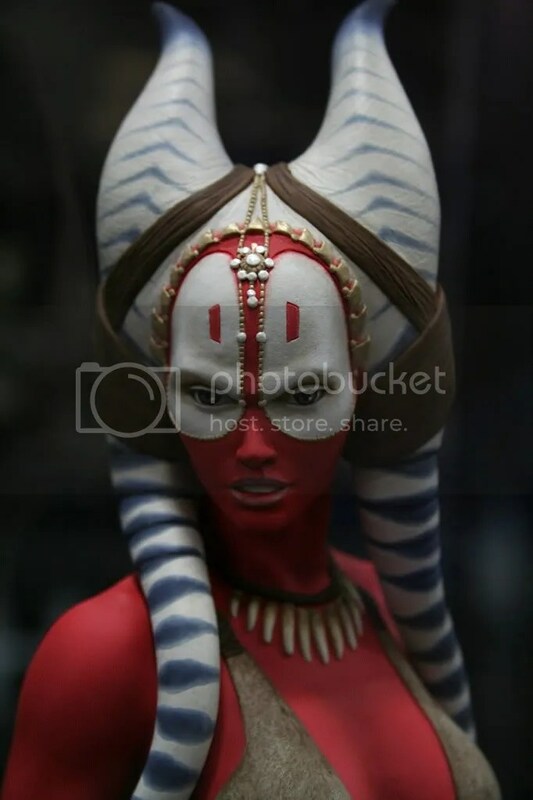 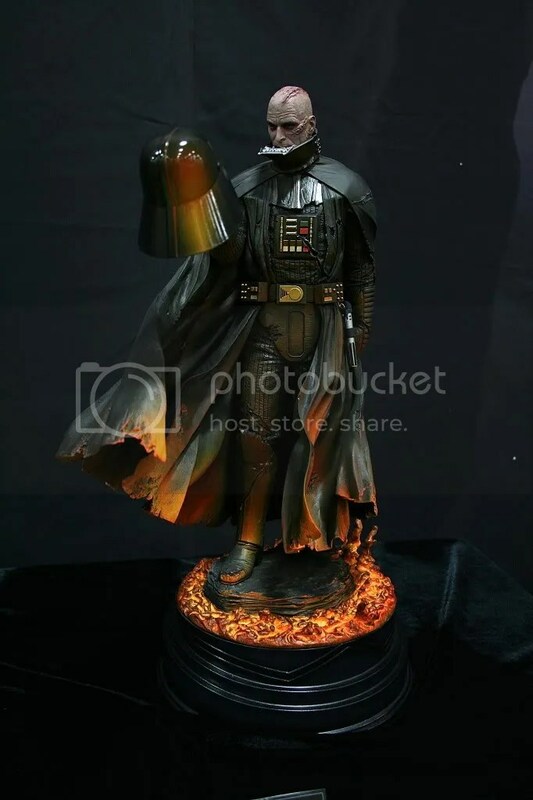 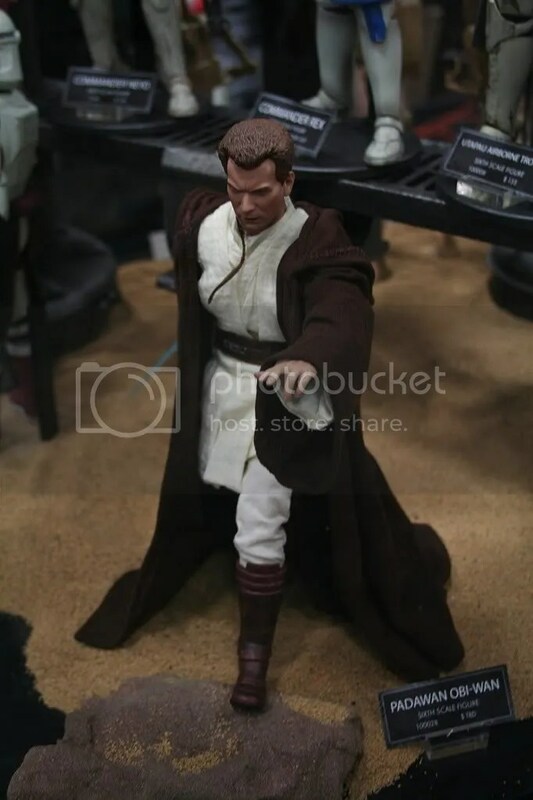 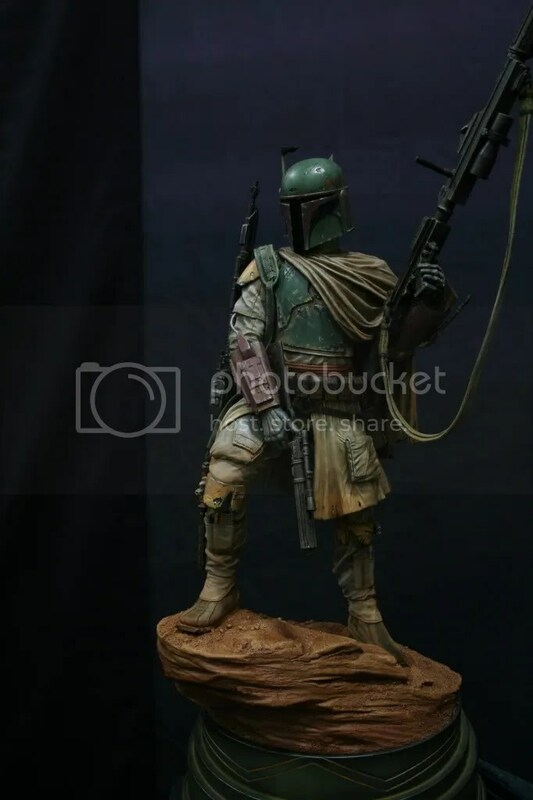 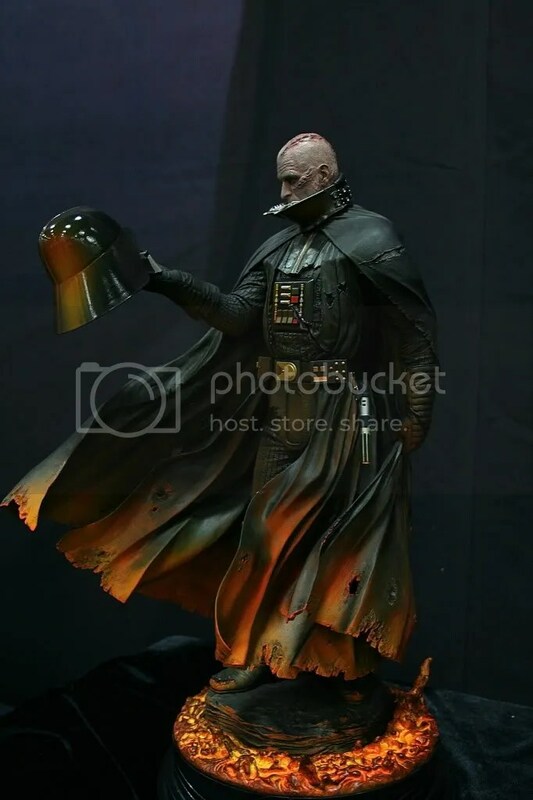 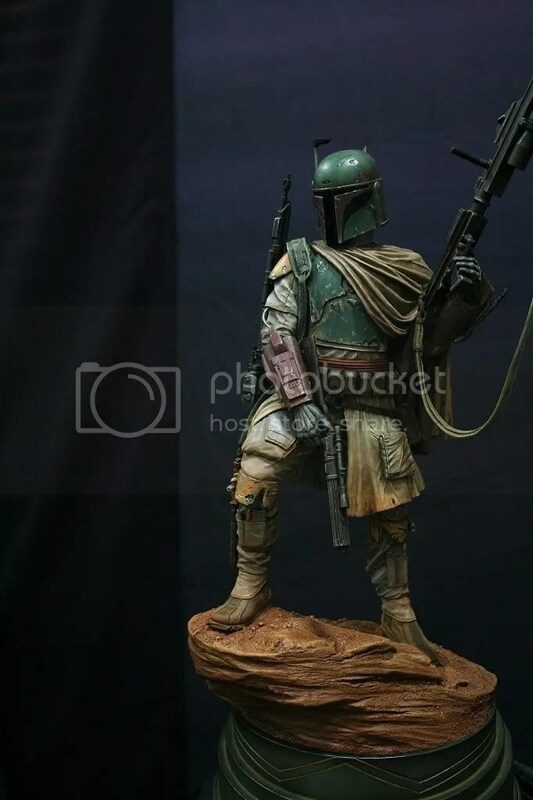 I know I will be adding several of these items like the Darth Vader, Obi-Wan Kenobi, and Darth Maul Mythos statues. 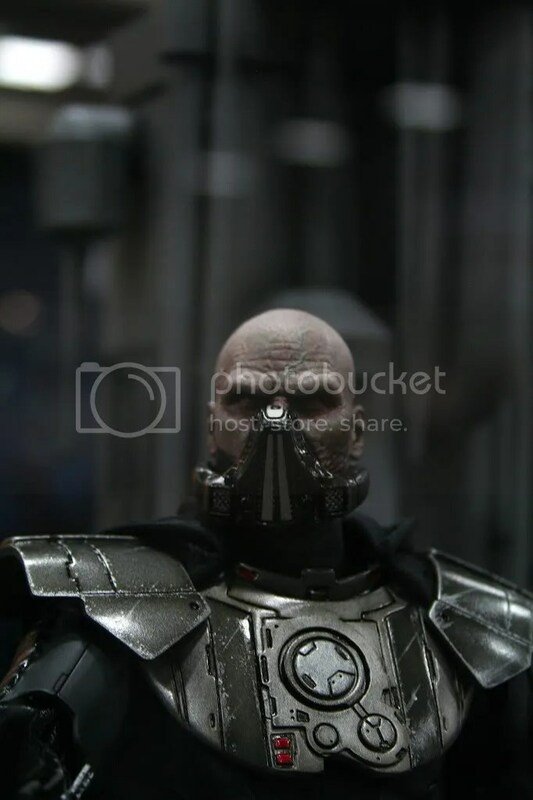 I will also be adding several of the 1:6th figures like Darth Malgus, Clones, Bossk, new Darth Vader, etc. 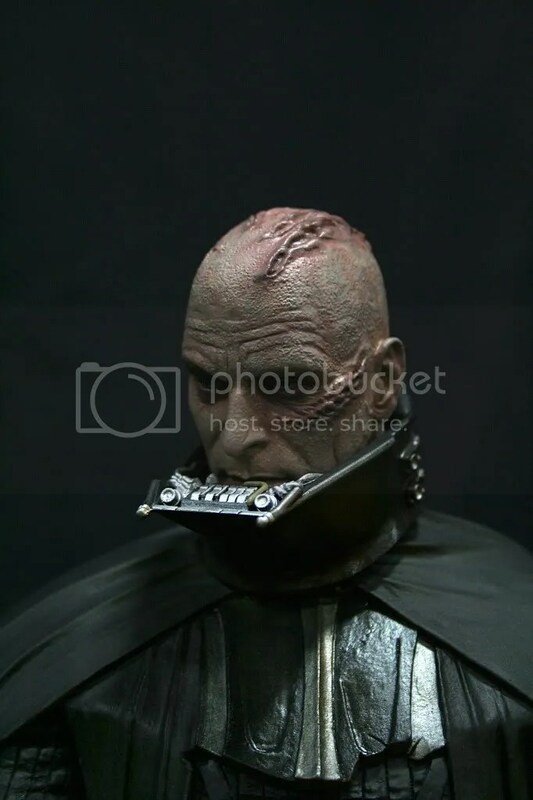 It was a good year for Star Wars. 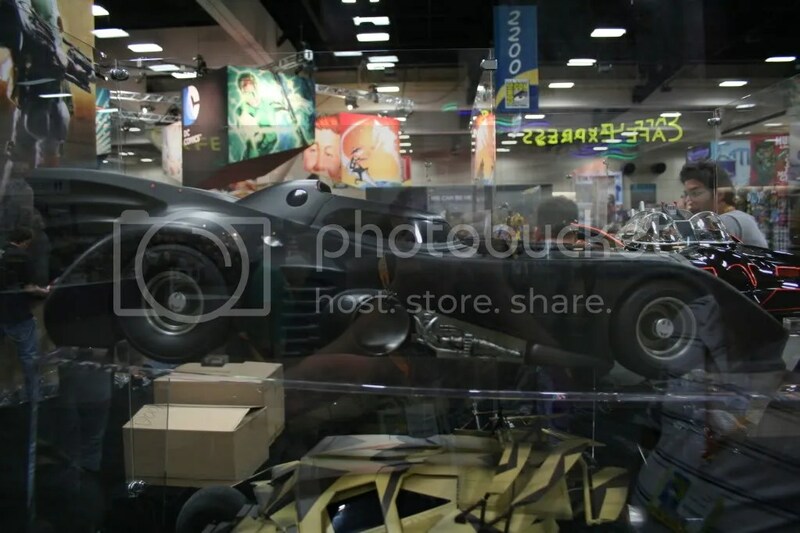 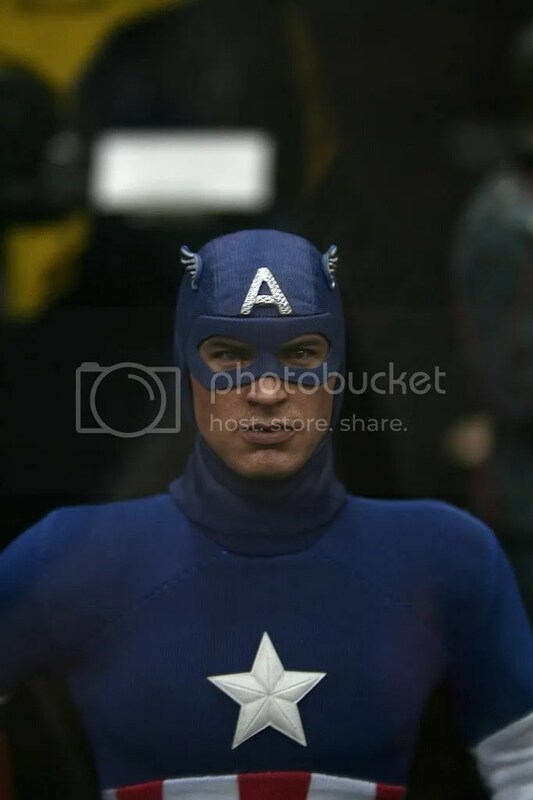 I’m late I know but I’m going to start recapping what we saw at Comic-Con today with pictures and video. 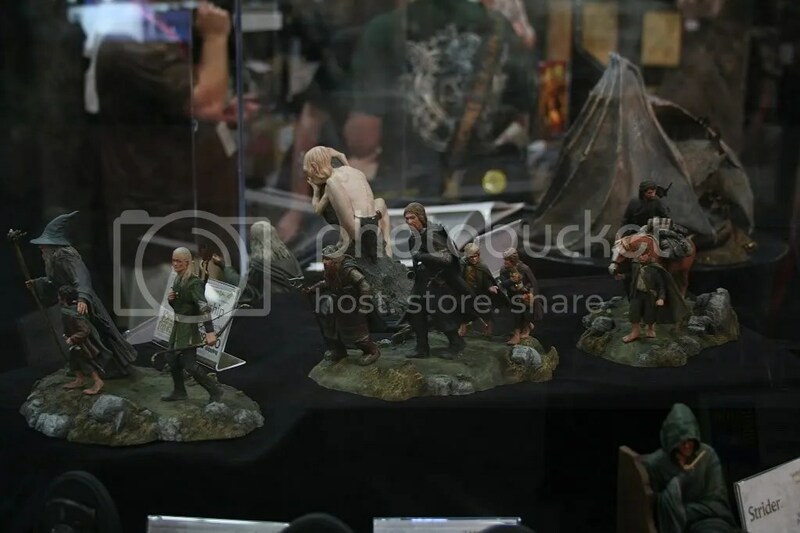 Today, I start with the items from The Lord of the Rings that Sideshow had at their booth. 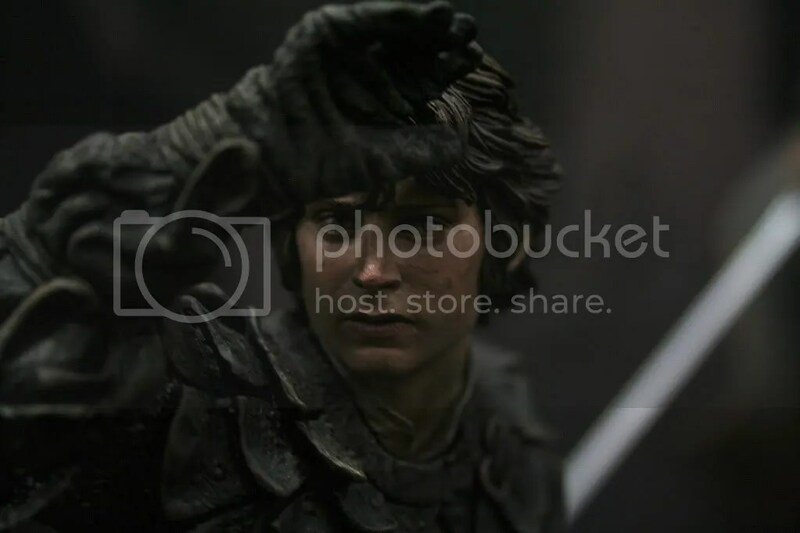 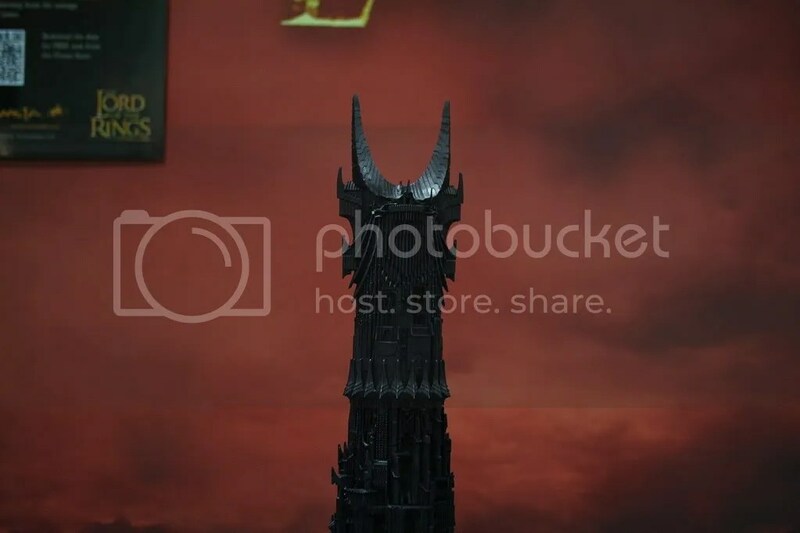 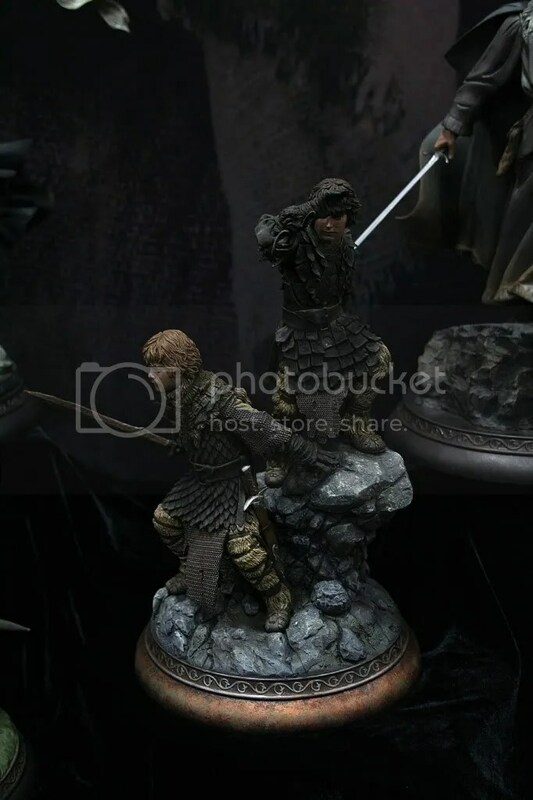 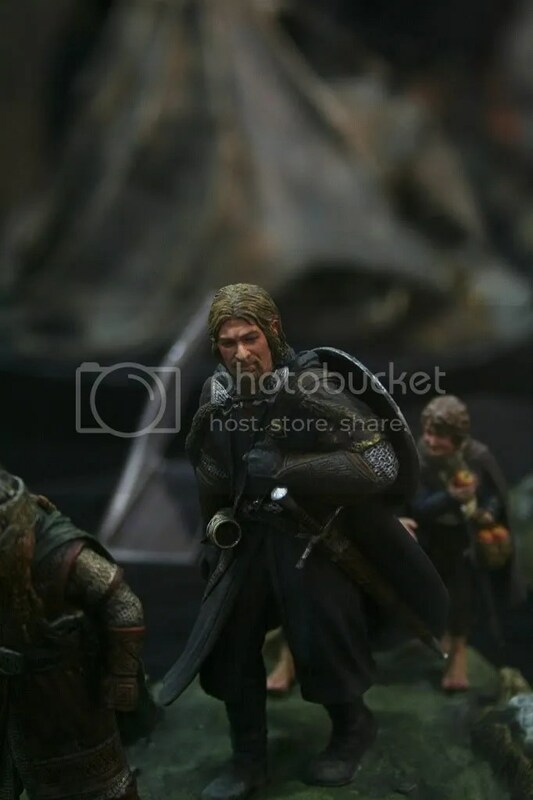 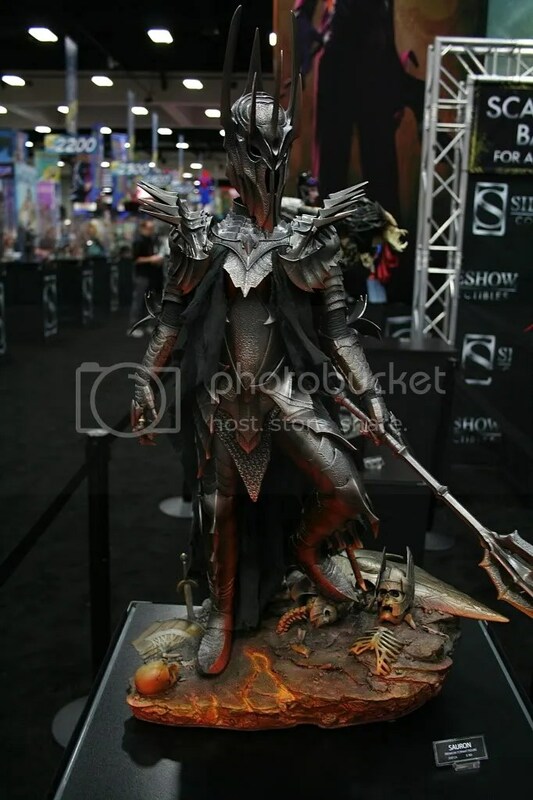 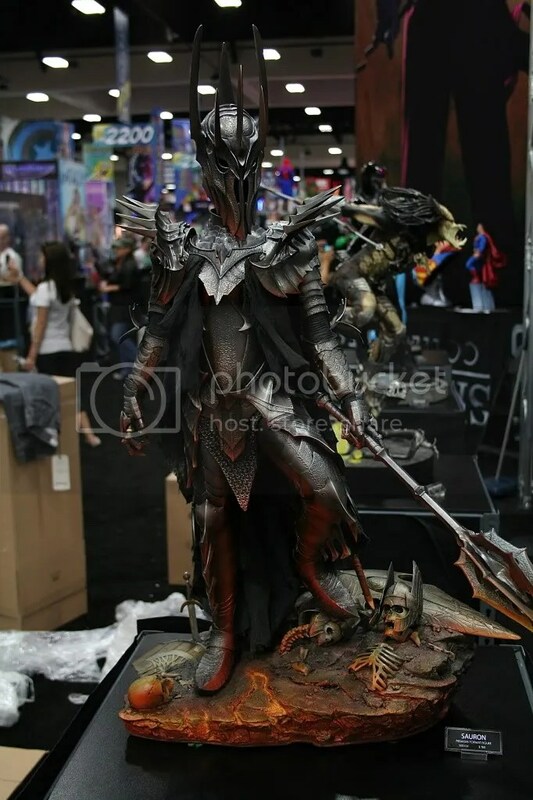 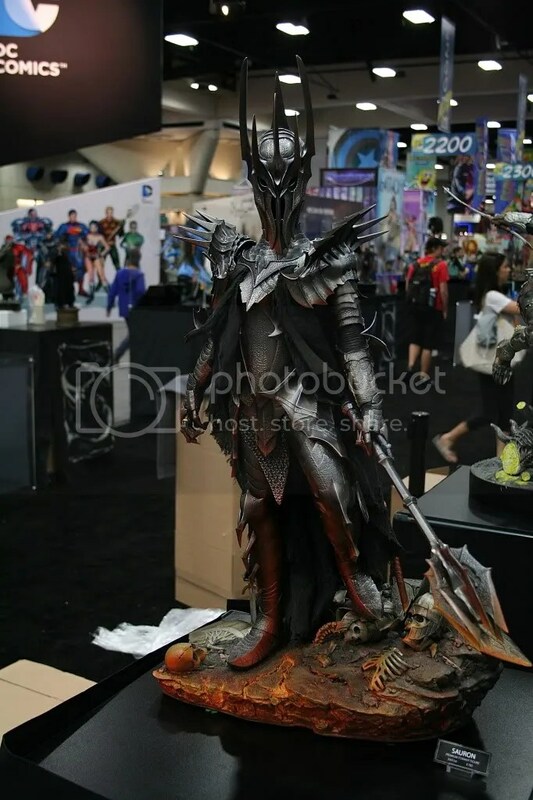 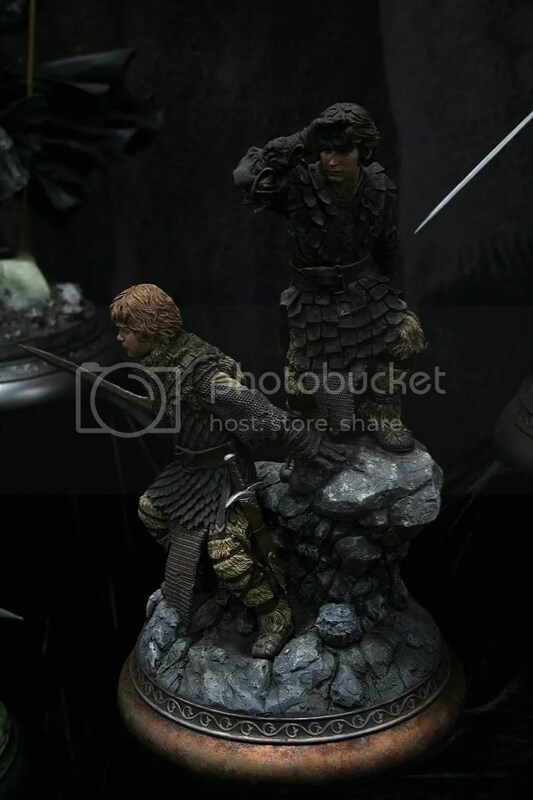 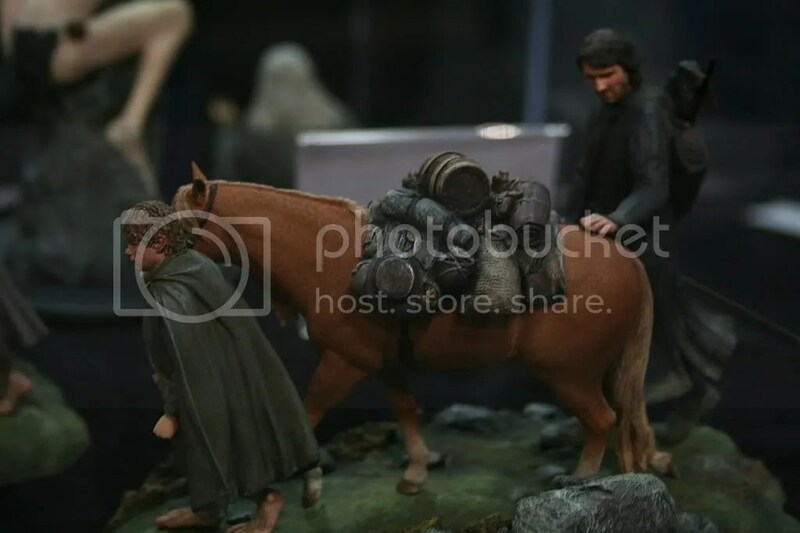 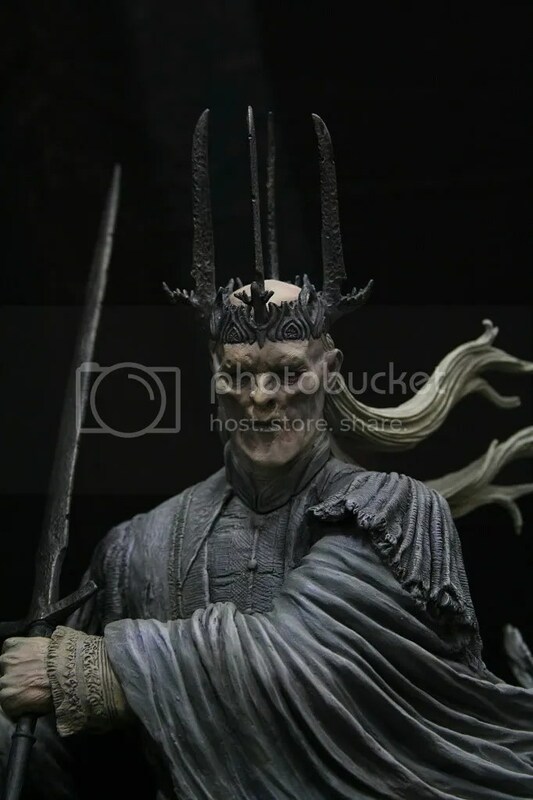 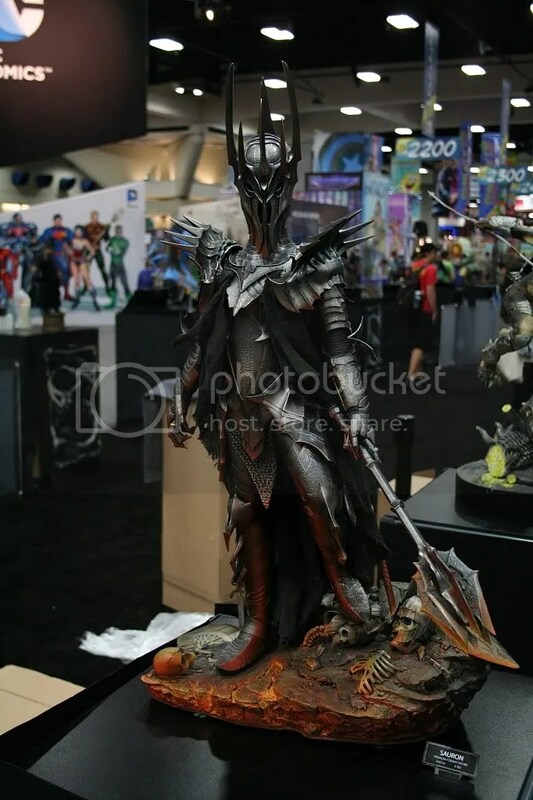 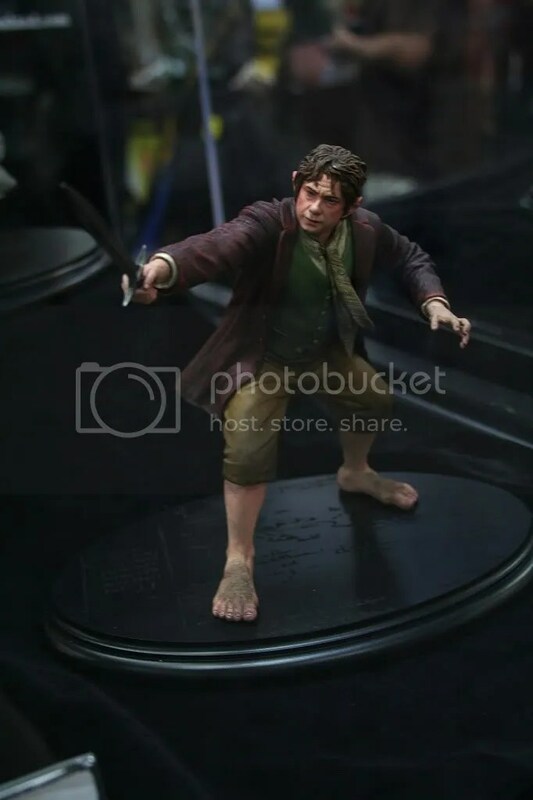 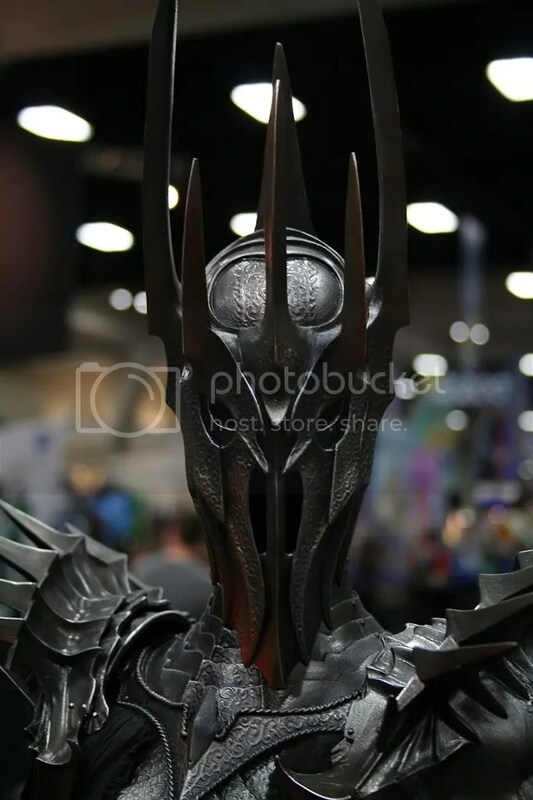 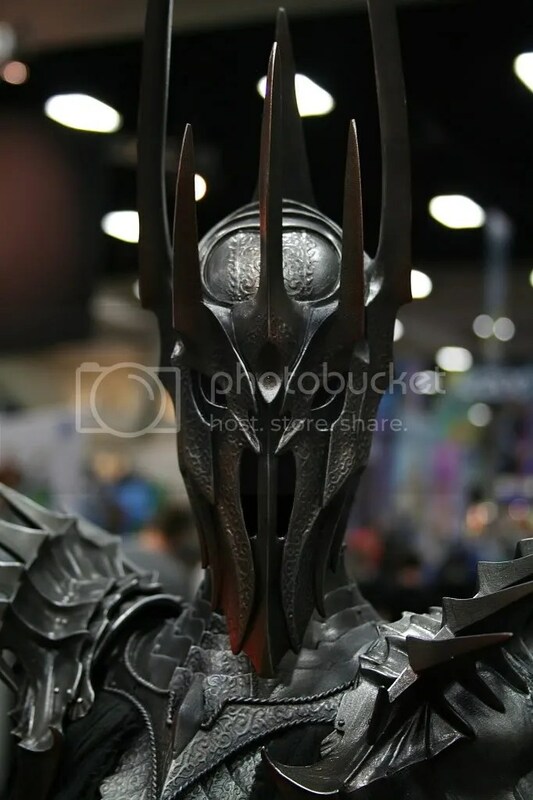 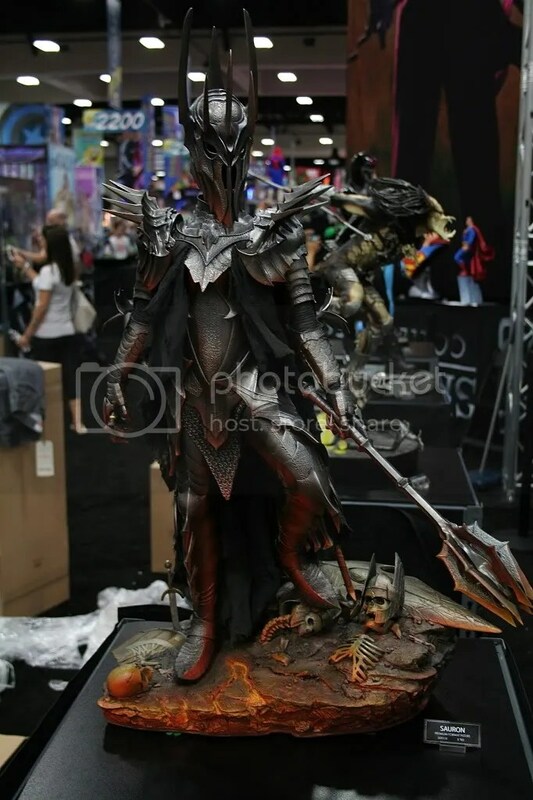 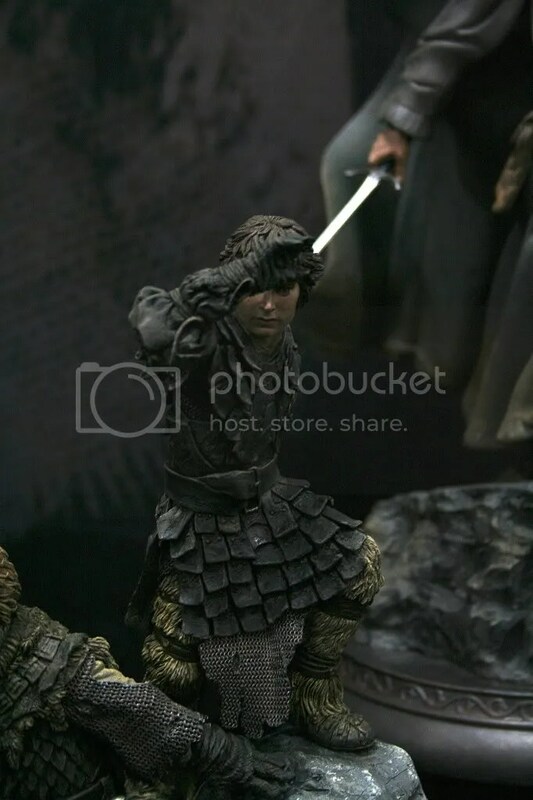 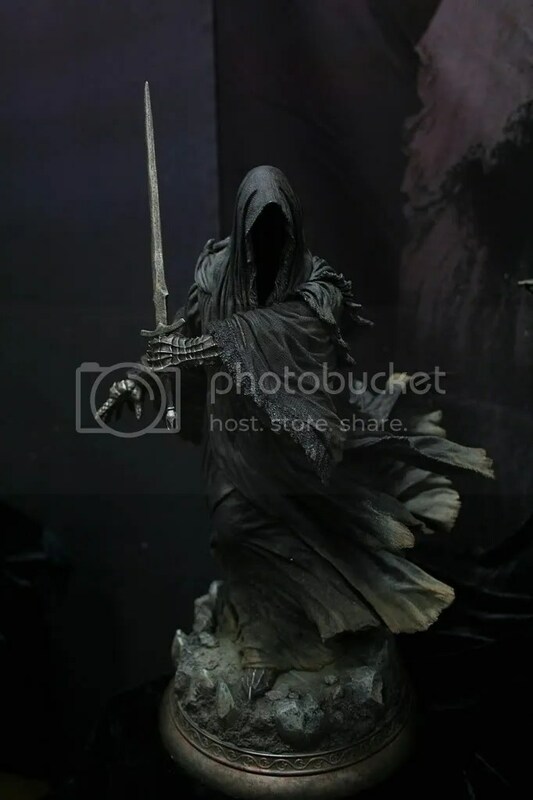 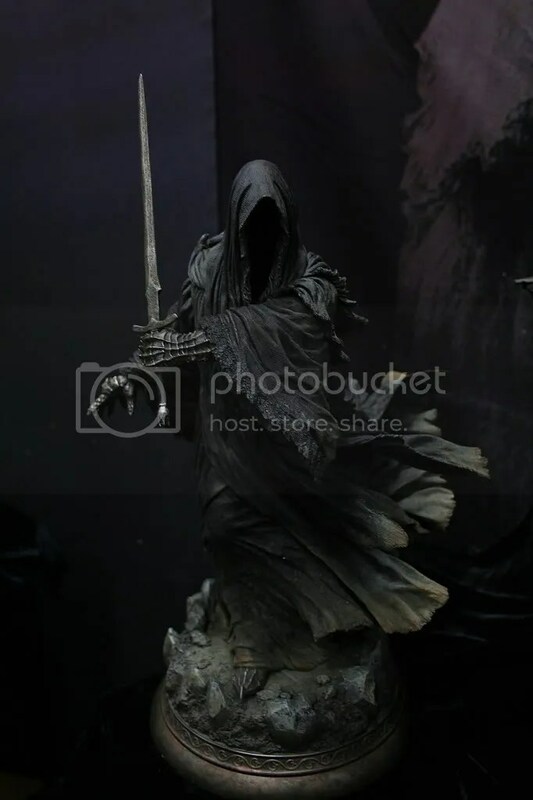 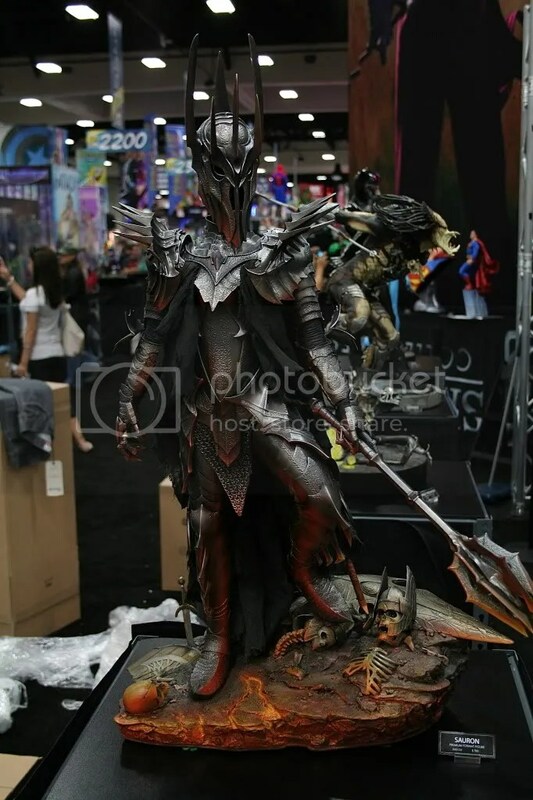 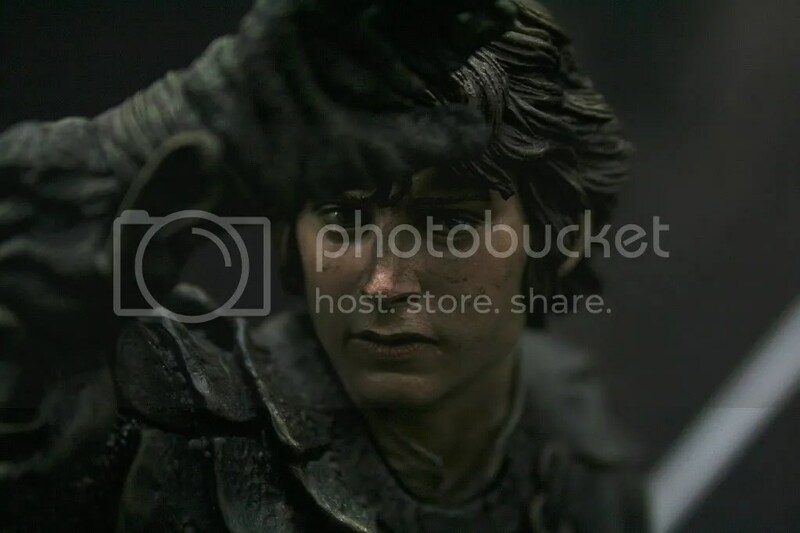 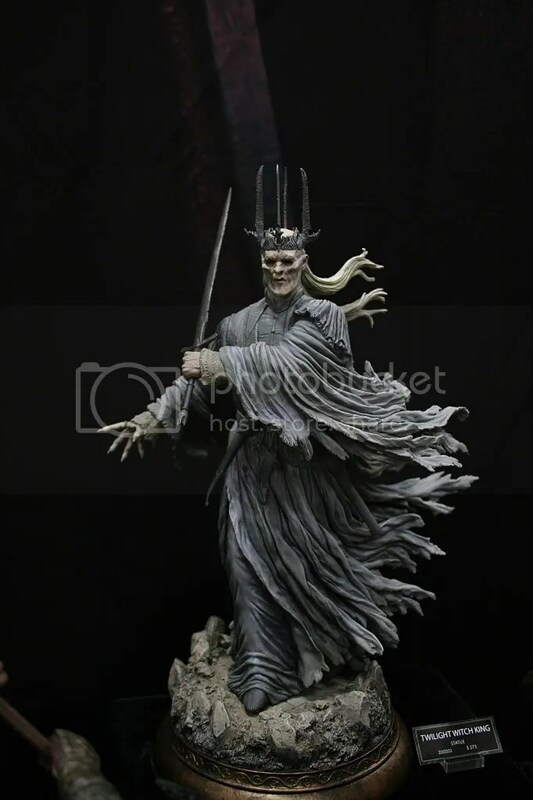 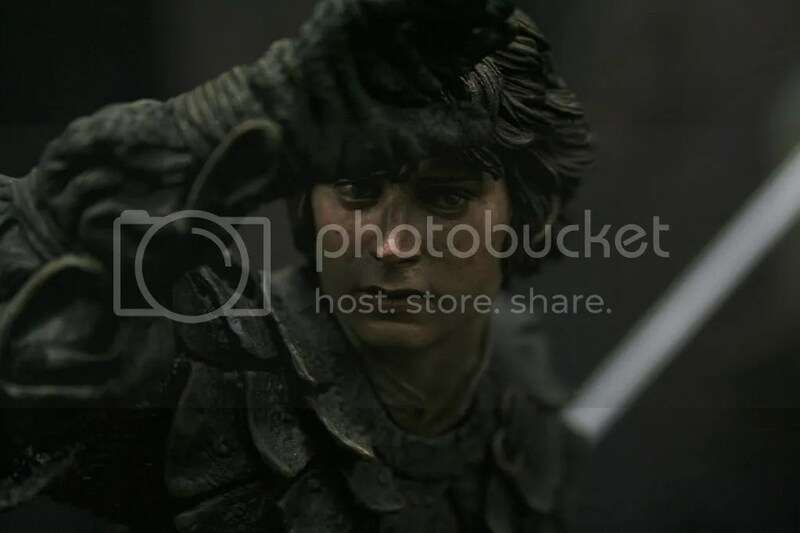 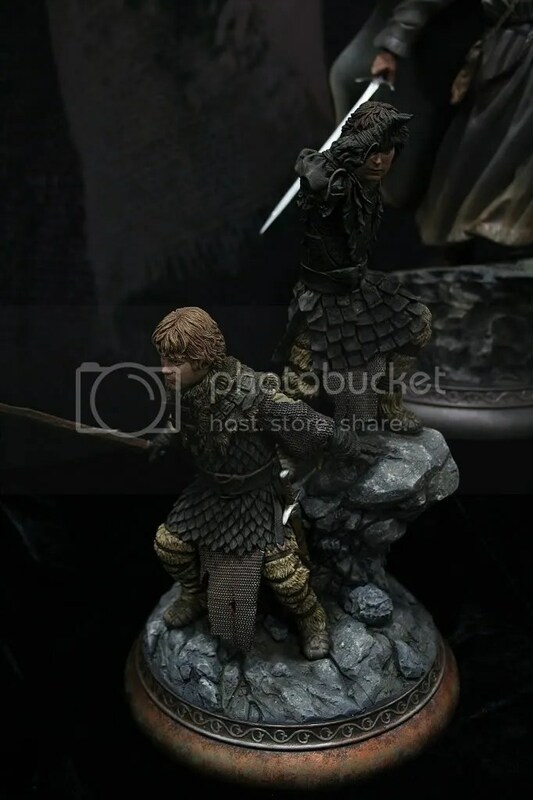 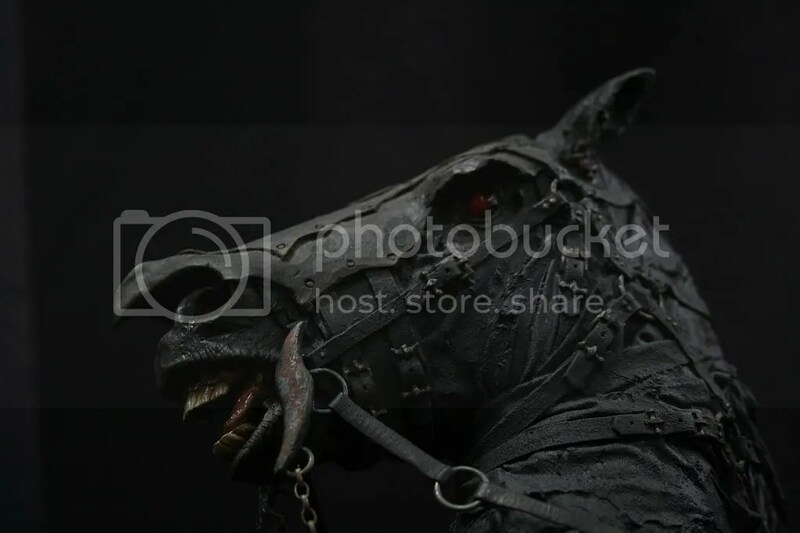 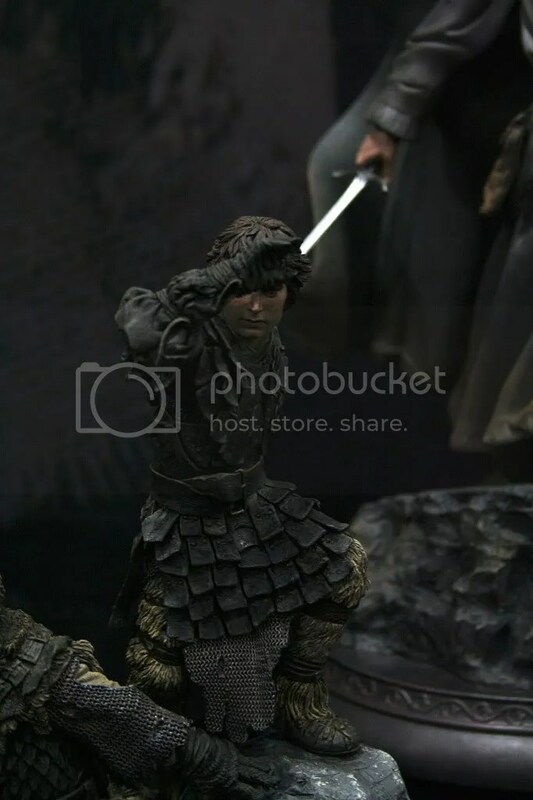 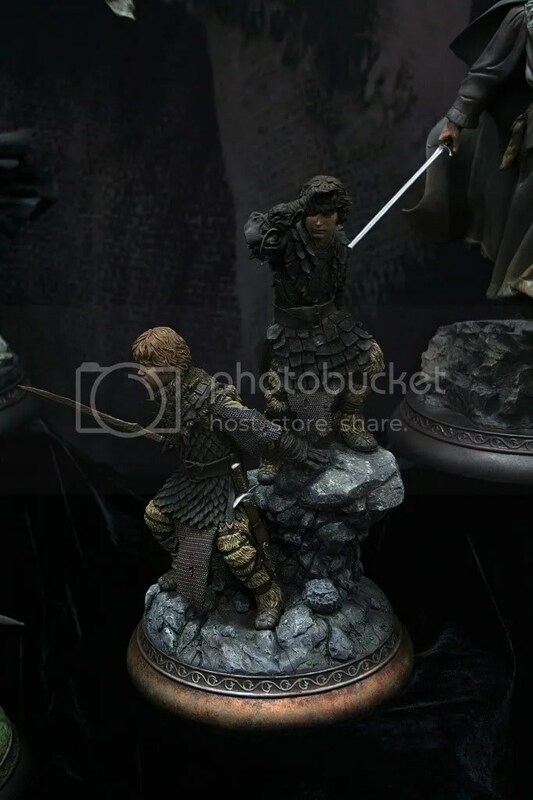 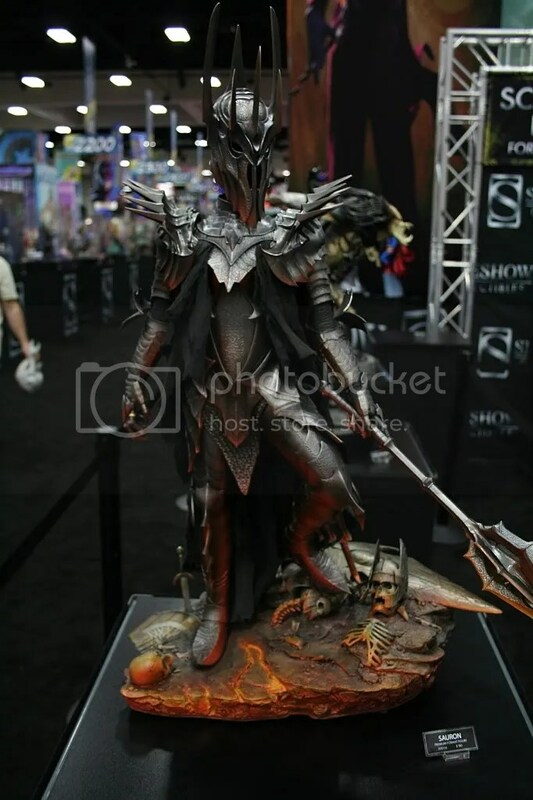 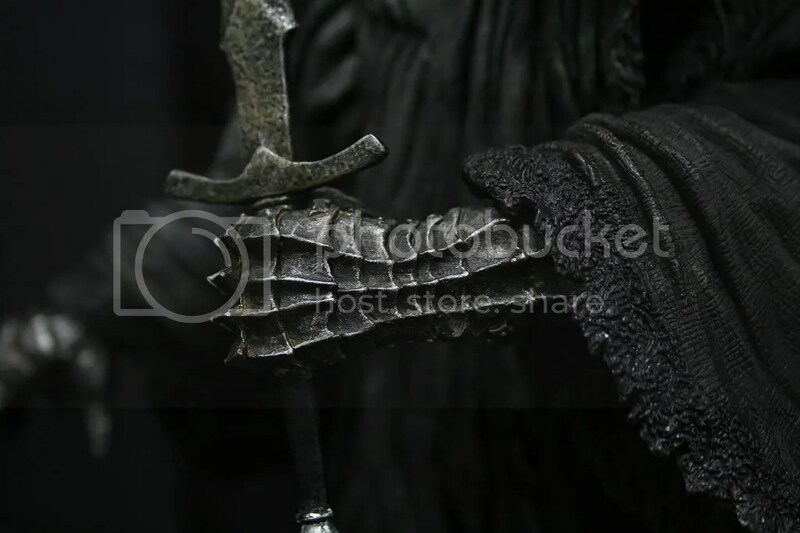 The three big items this year were the Frodo and Sam statue in Orc Armor, the Sauron Premium Format, and the Ringwraith on Steed Premium Format. 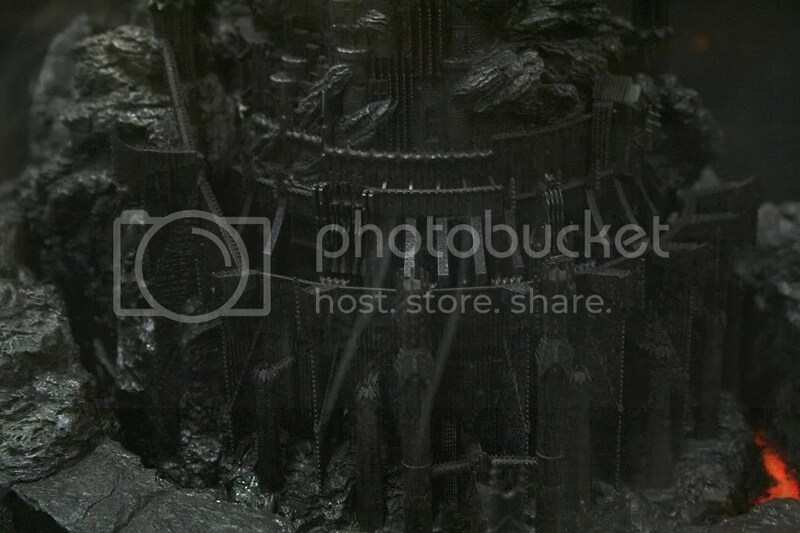 Enjoy the pictures and the video. 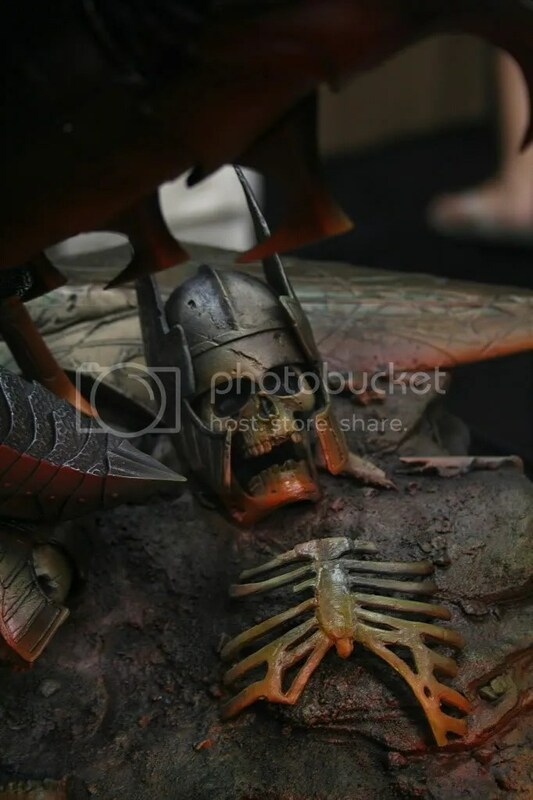 Day 15 of Sideshow Collectibles Online Comic-Con Event brings us a world eating item from the Marvel Universe and something from the Predator Universe. 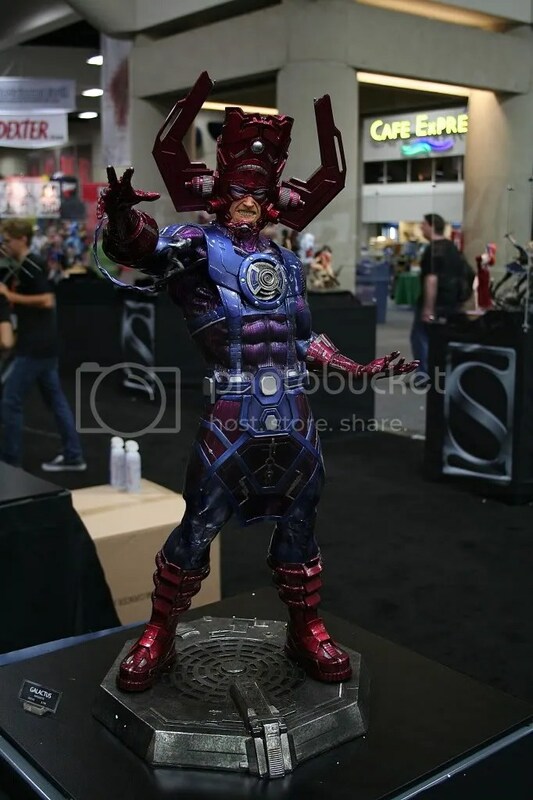 The Marvel item is the Galactus Maquette standing an impressive 33″ tall this will tower over anything you have in your Marvel collection. 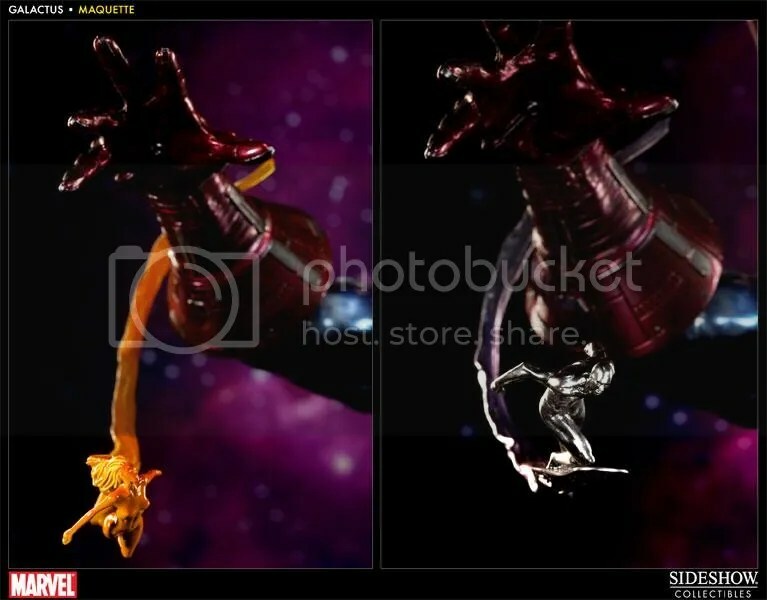 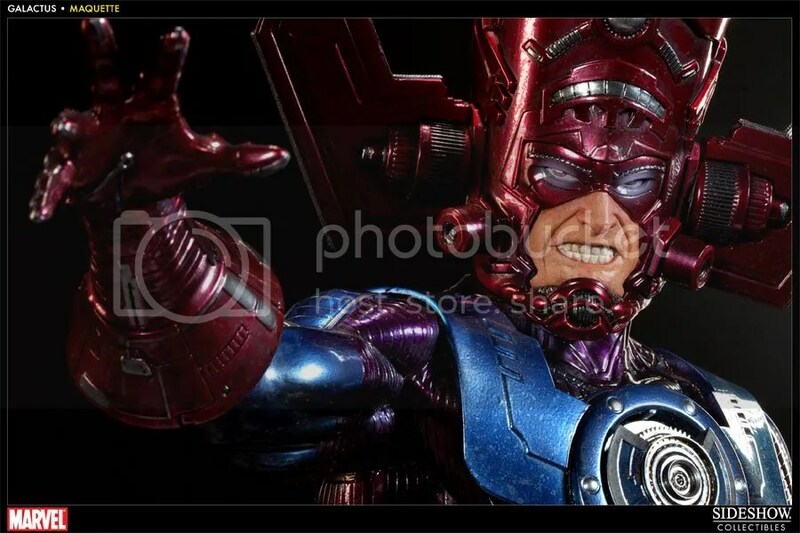 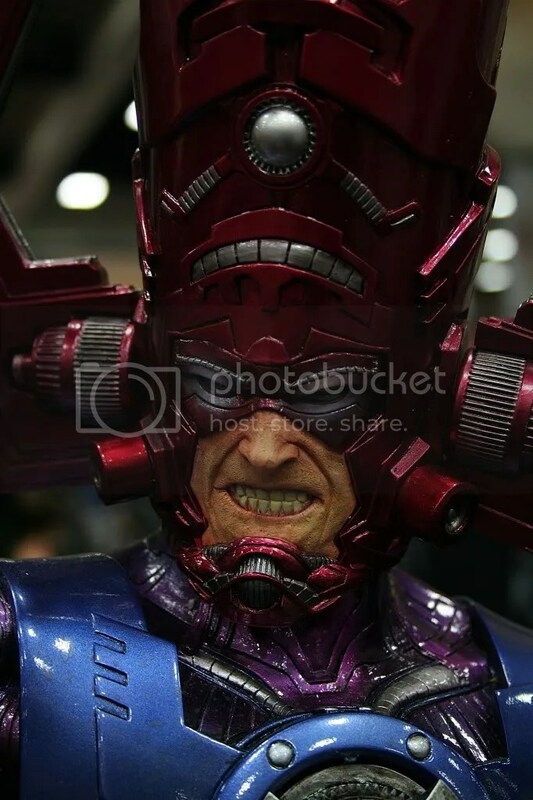 Galactus will comes with switch out sculpts, switch out Nova/Silver Surfer, and a price of $800 ($80 NRD charged at purchase). 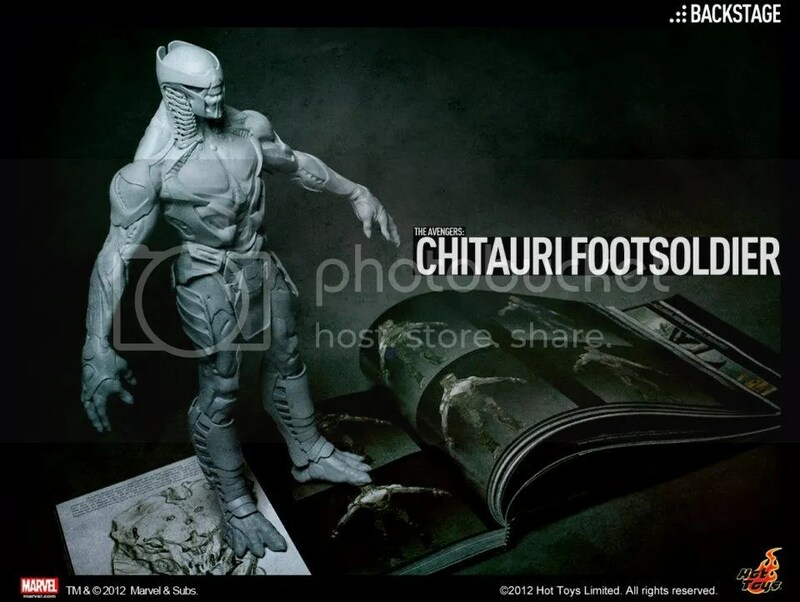 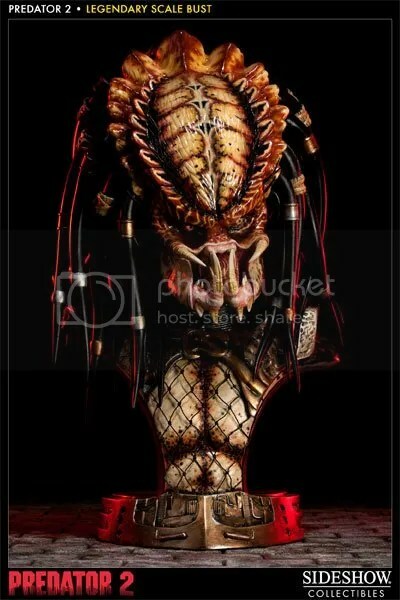 From Predator 2 we get the LSB of the main Predator from that movie with an exclusive name plate if you guy that version for $390 ($39 NRD). 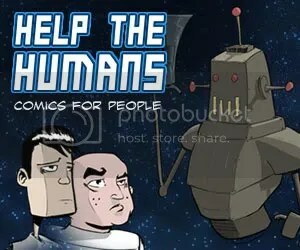 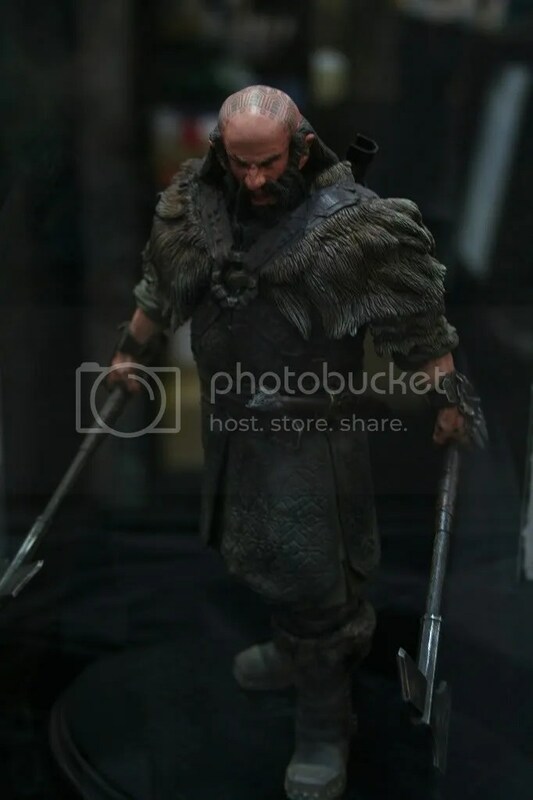 My friends at TheOneRing.Net announced tonight that Gentle Giant has announced one more exclusive for Comic-Con 2012. 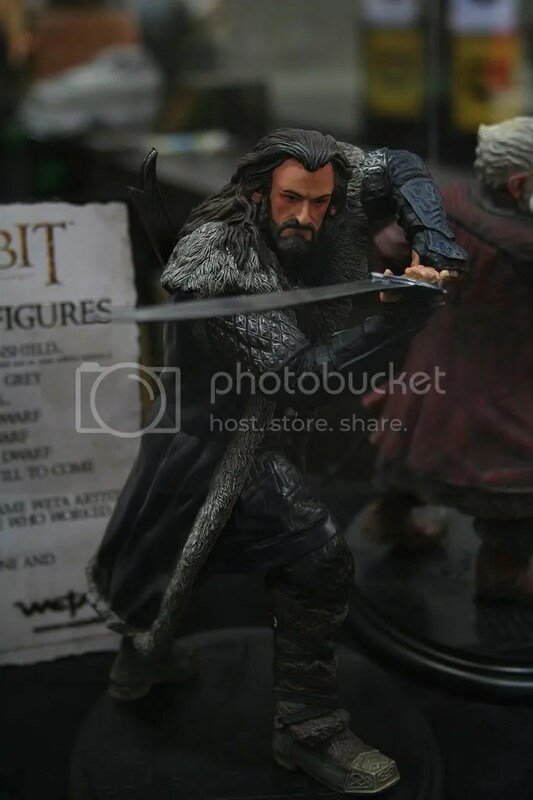 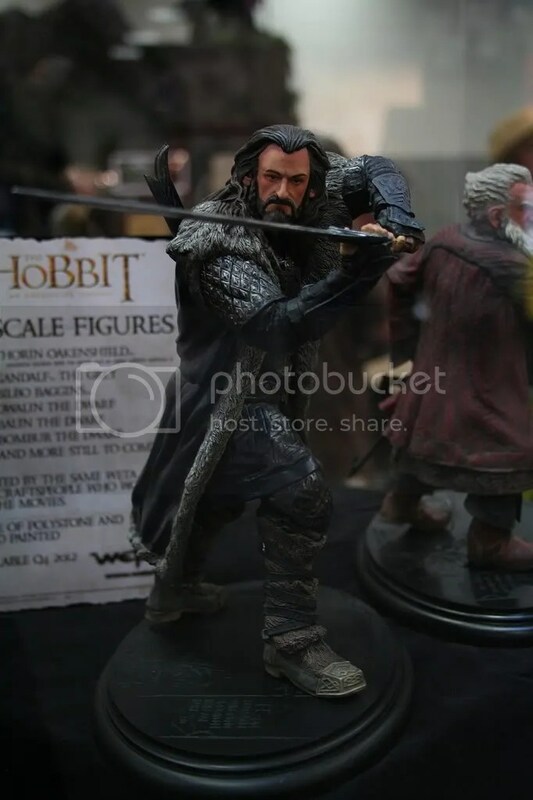 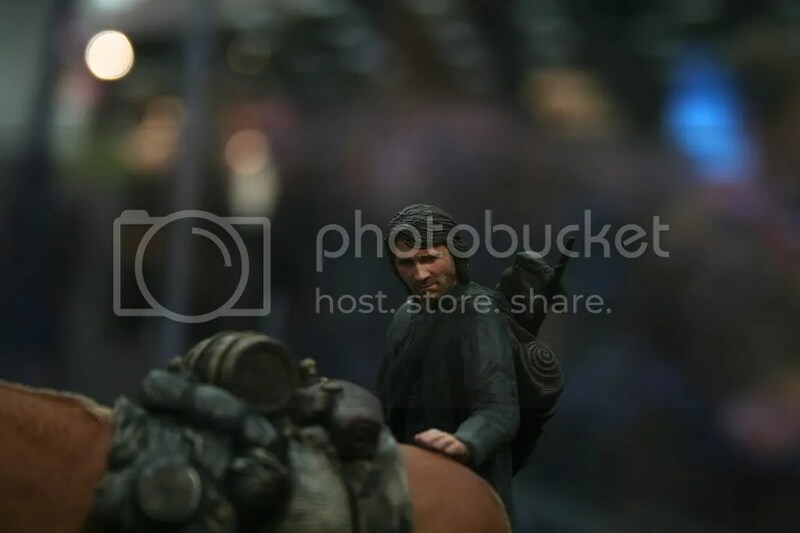 Thorin will be sold at the Gentle Giant booth #3513 For $70 with an edition size of 500 pieces world wide. 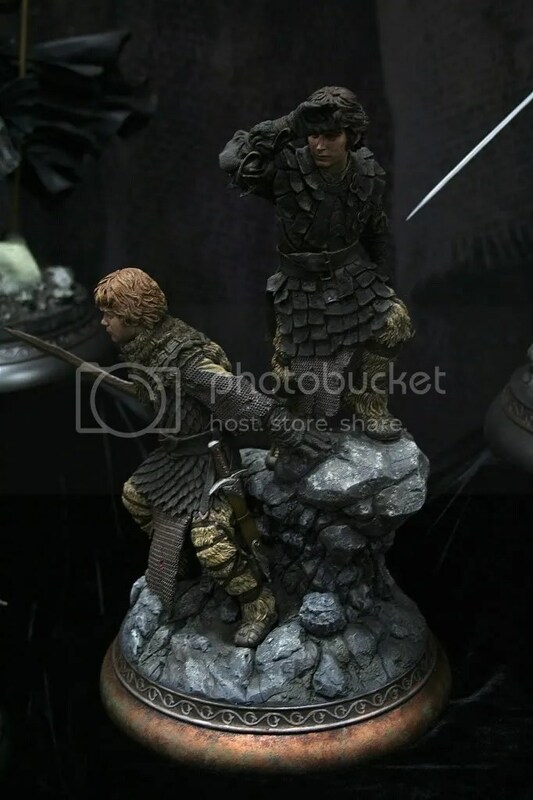 You will also be able to buy this starting at 6pm via their web site.